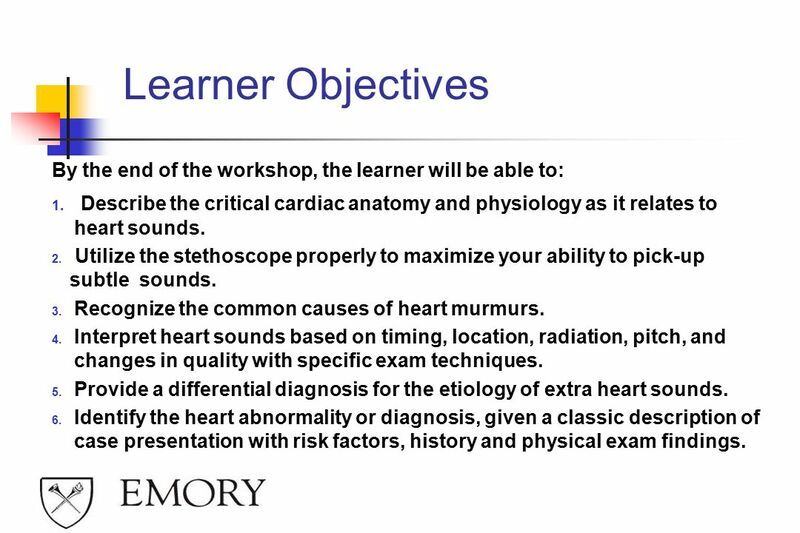 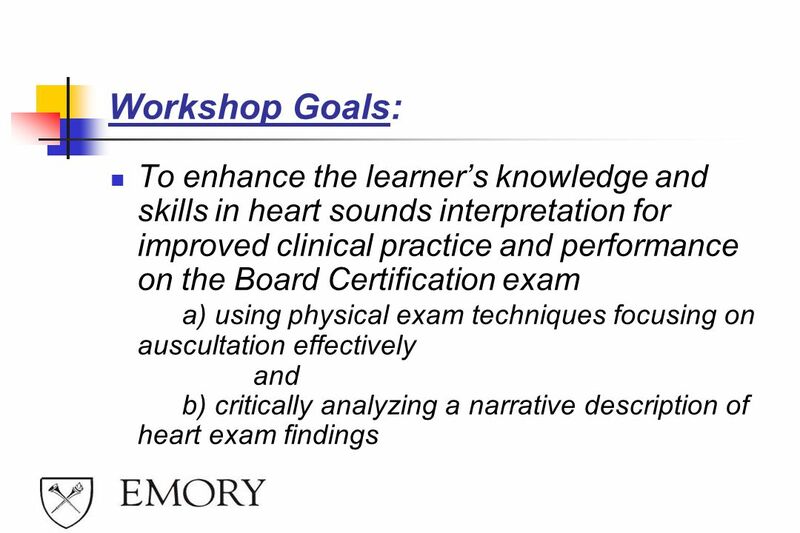 3 Learner Objectives By the end of the workshop, the learner will be able to: Describe the critical cardiac anatomy and physiology as it relates to heart sounds. 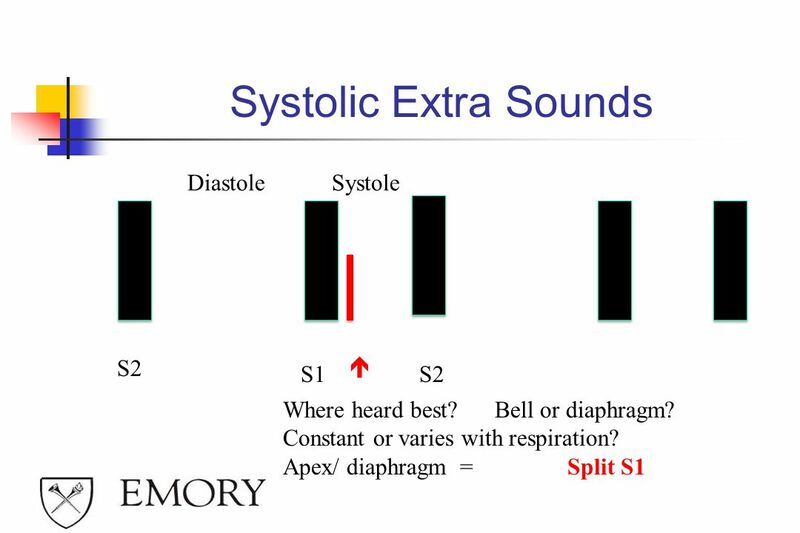 Utilize the stethoscope properly to maximize your ability to pick-up subtle sounds. 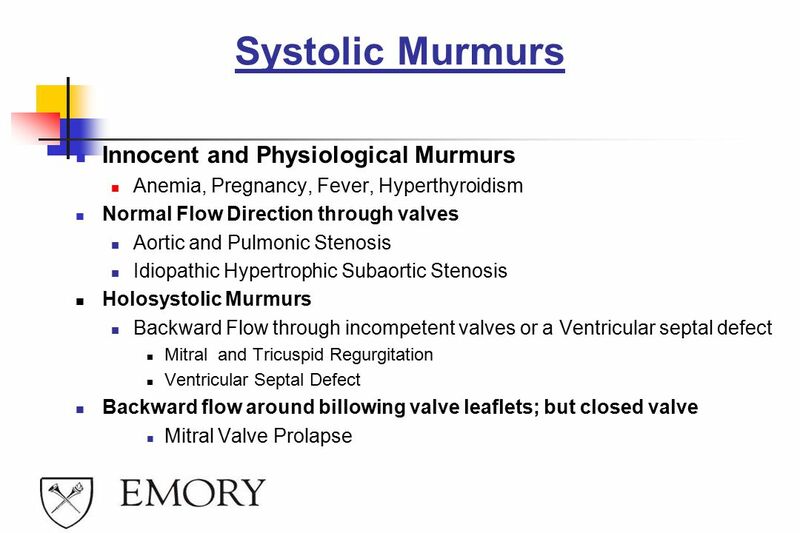 Recognize the common causes of heart murmurs. 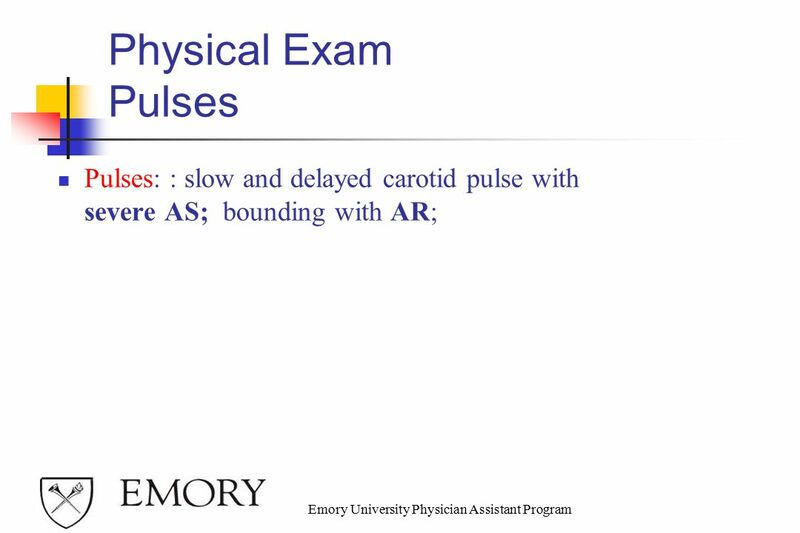 Interpret heart sounds based on timing, location, radiation, pitch, and changes in quality with specific exam techniques. 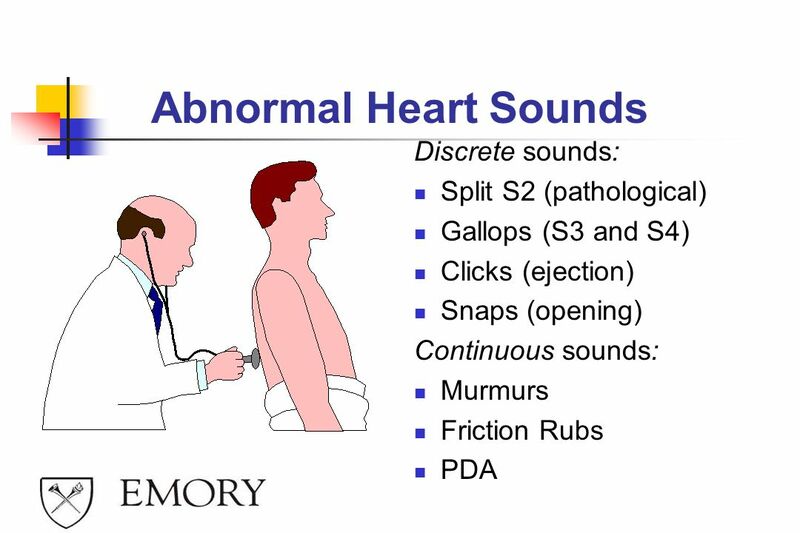 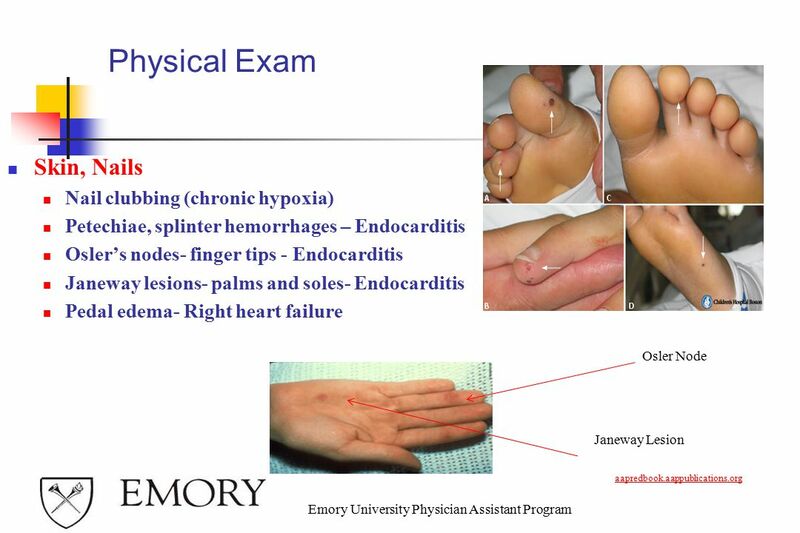 Provide a differential diagnosis for the etiology of extra heart sounds. 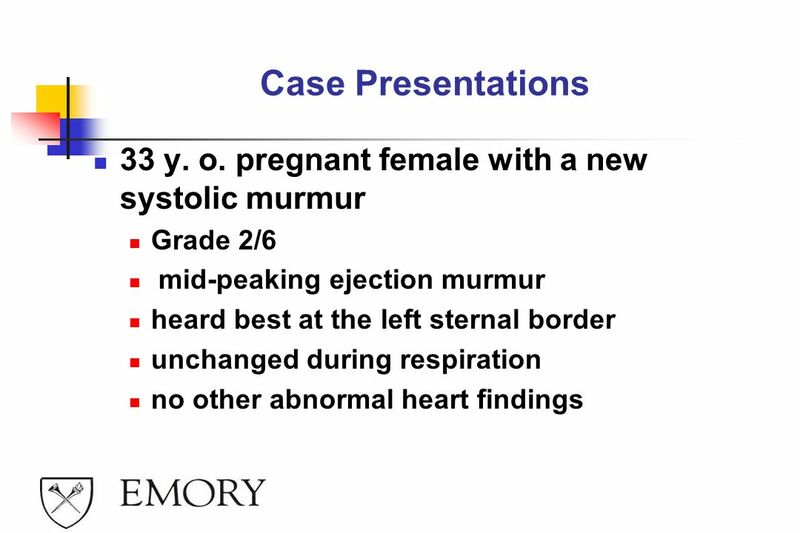 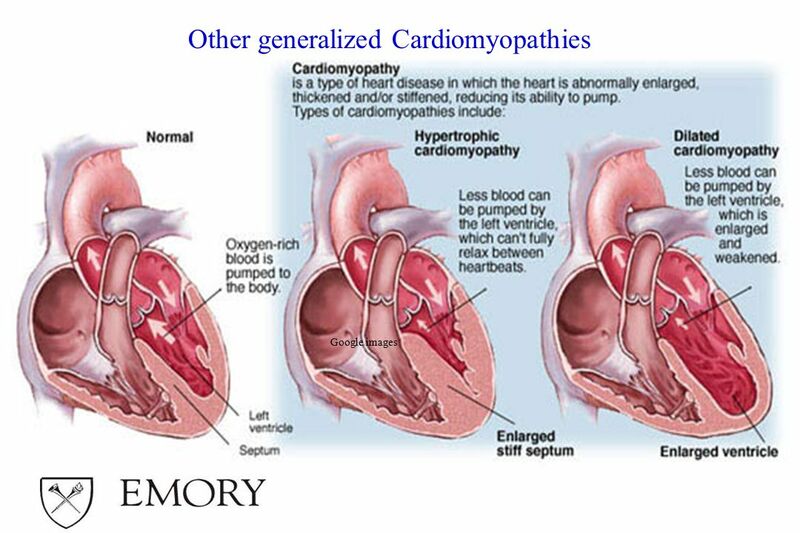 Identify the heart abnormality or diagnosis, given a classic description of case presentation with risk factors, history and physical exam findings. 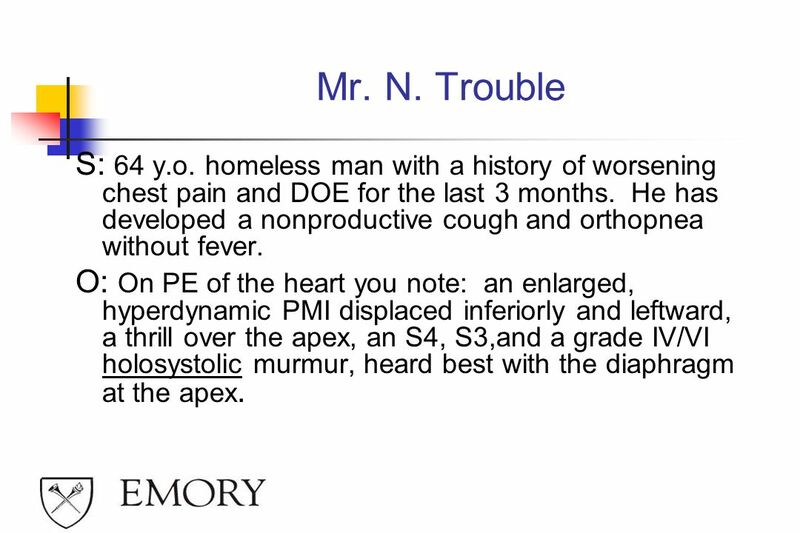 Mr. N. Trouble is a 64 y.o. 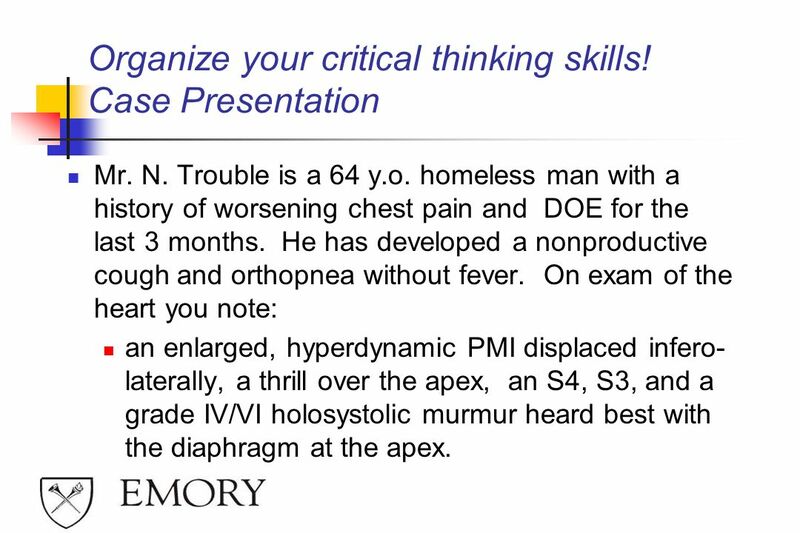 homeless man with a history of worsening chest pain and DOE for the last 3 months. 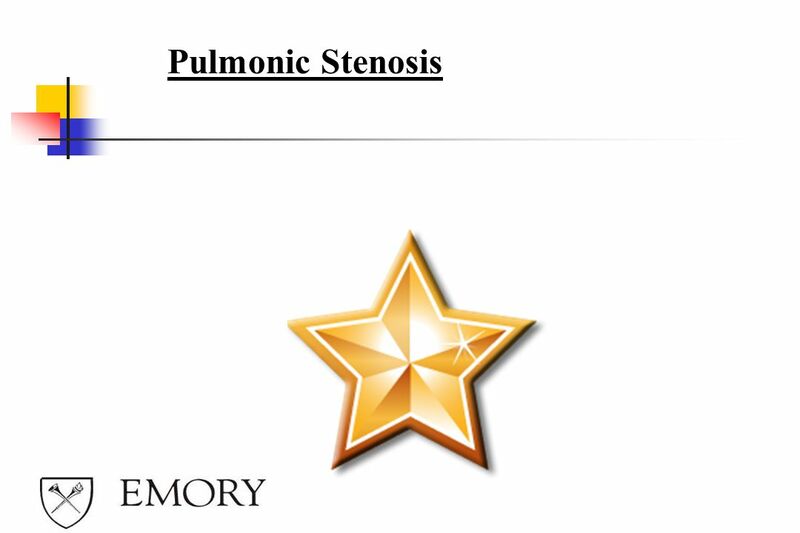 He has developed a nonproductive cough and orthopnea without fever. 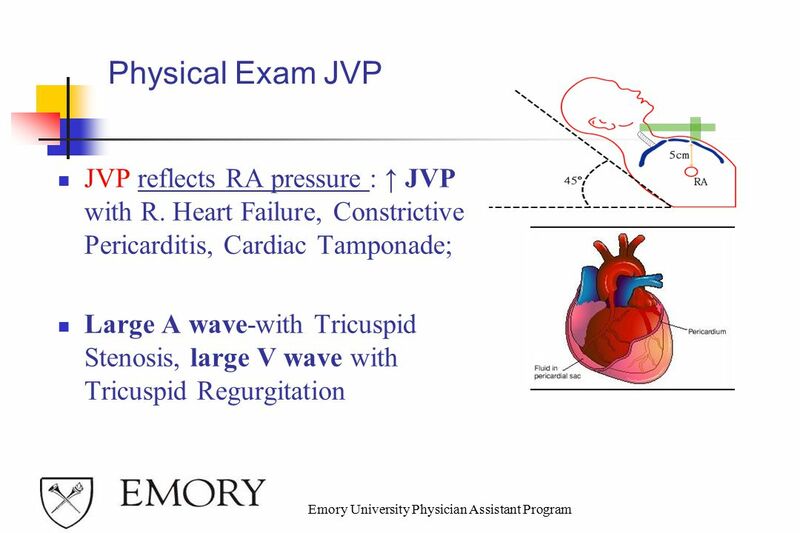 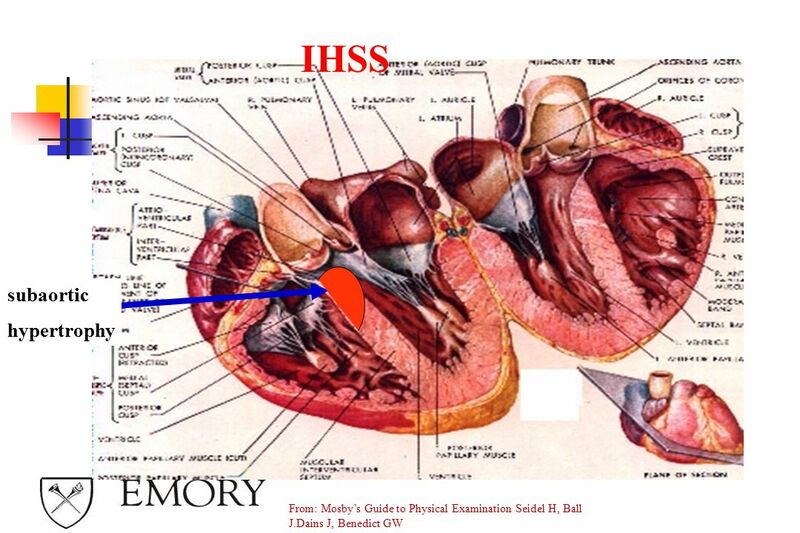 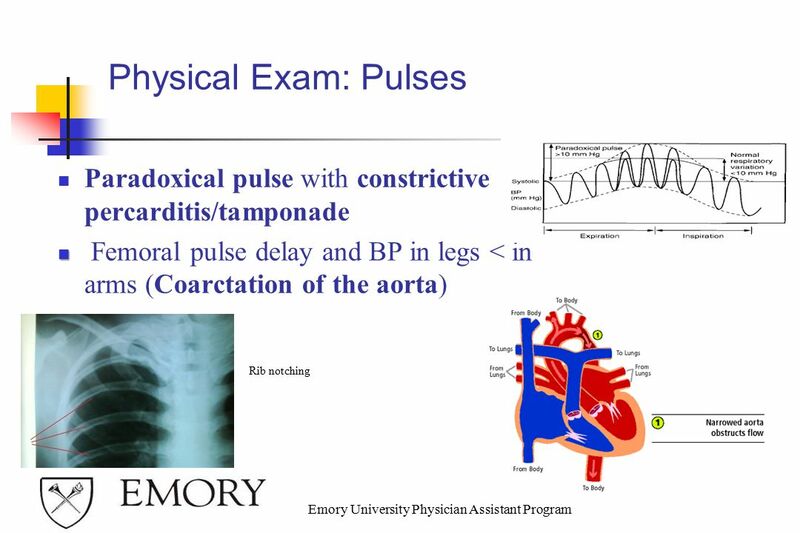 On exam of the heart you note: an enlarged, hyperdynamic PMI displaced infero-laterally, a thrill over the apex, an S4, S3, and a grade IV/VI holosystolic murmur heard best with the diaphragm at the apex. 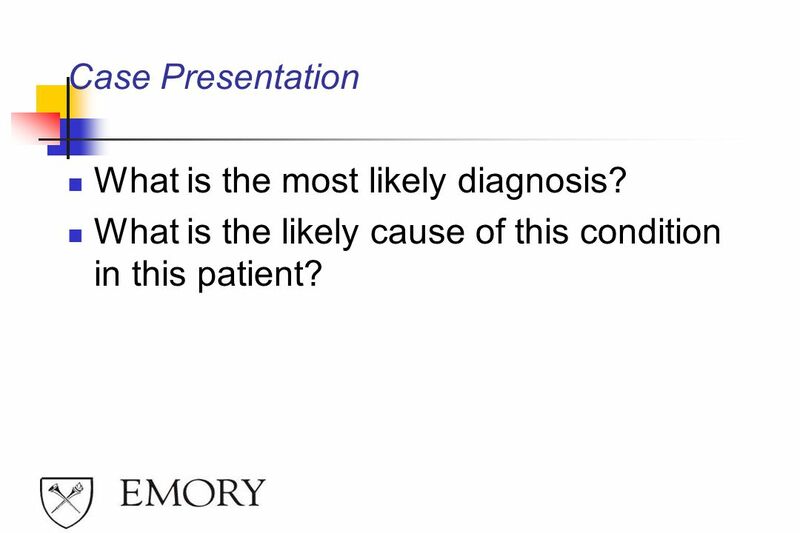 5 Case Presentation What is the most likely diagnosis? 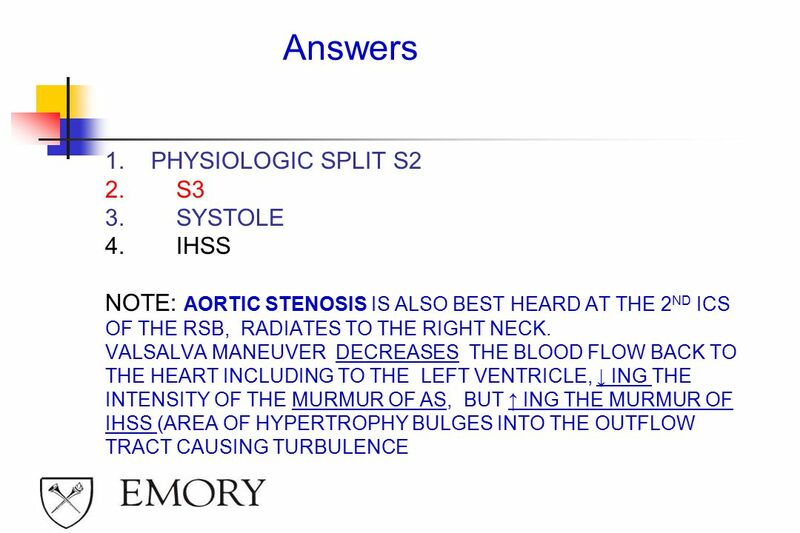 What is the likely cause of this condition in this patient? 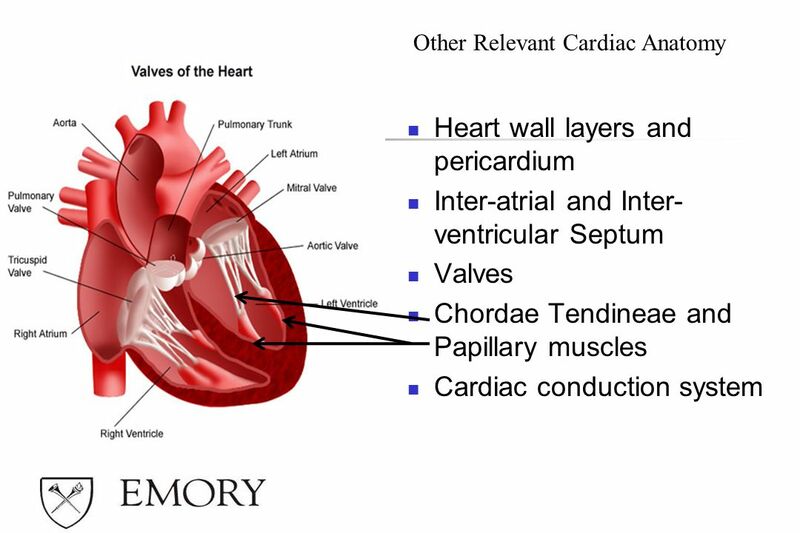 Other Relevant Cardiac Anatomy Heart wall layers and pericardium Inter-atrial and Inter-ventricular Septum Valves Chordae Tendineae and Papillary muscles Cardiac conduction system Three layers: Endocardium, Myocardium, Epicardium Septum between atria, or between ventricles may have an opening ( ASD, VSD) which may cause a murmur Normally heart valves open in one direction Valves allowing backward flow of blood are incompetent and cause regurgitant murmurs. 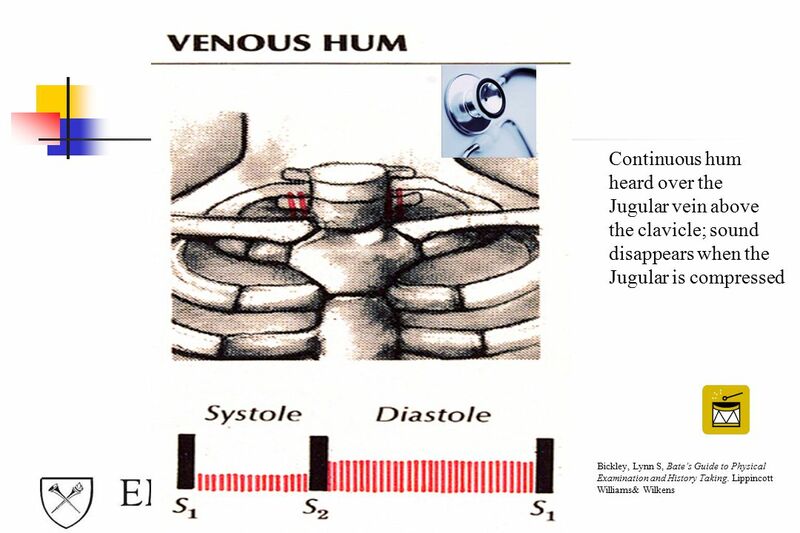 Stiff, narrow valves cause valvular stenosis. 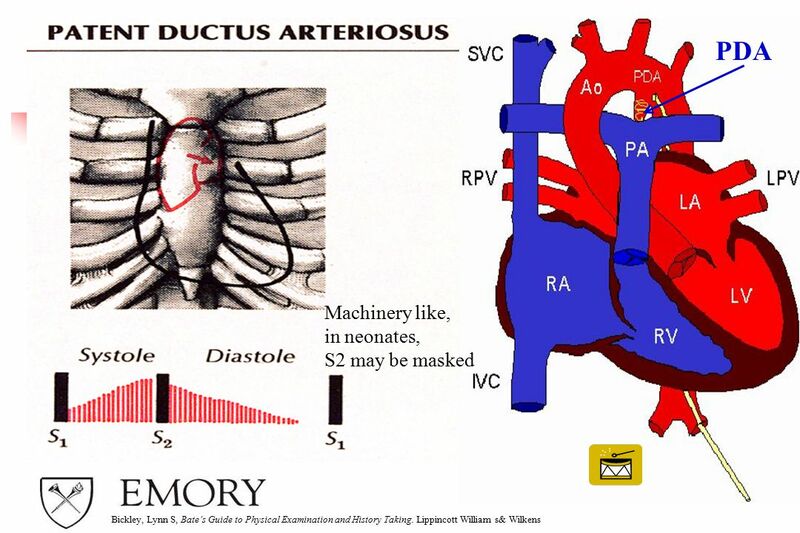 Chordae Tendinae act as ligaments between the papillary muscles and the A/V valves ( Tricuspid and Mitral). 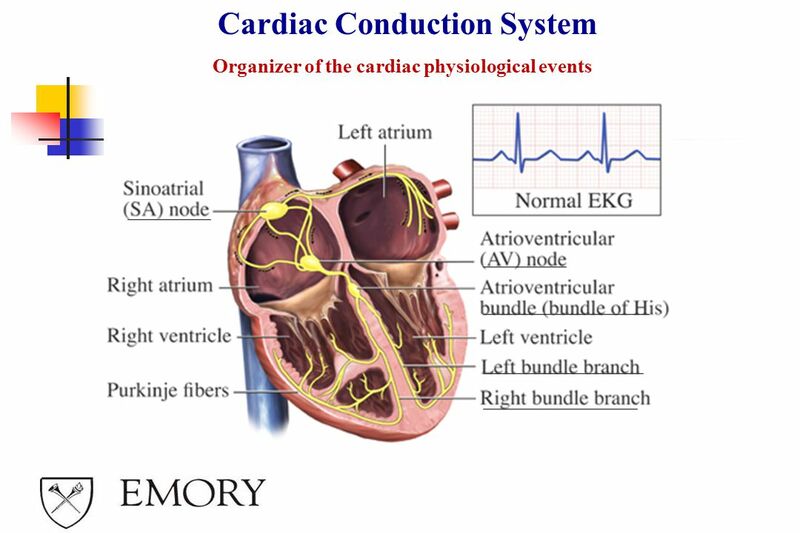 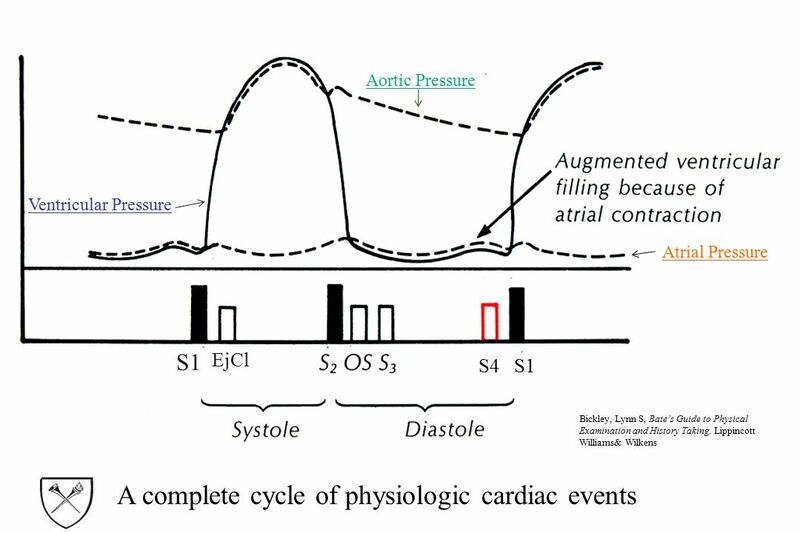 Conduction System serves to organize the physiological events of the heart: Sinoatrial(SA) node to Atrioventricular(AV) node, to Bundle of His to Right and Left Bundle Branches and Perkinje Fibers. 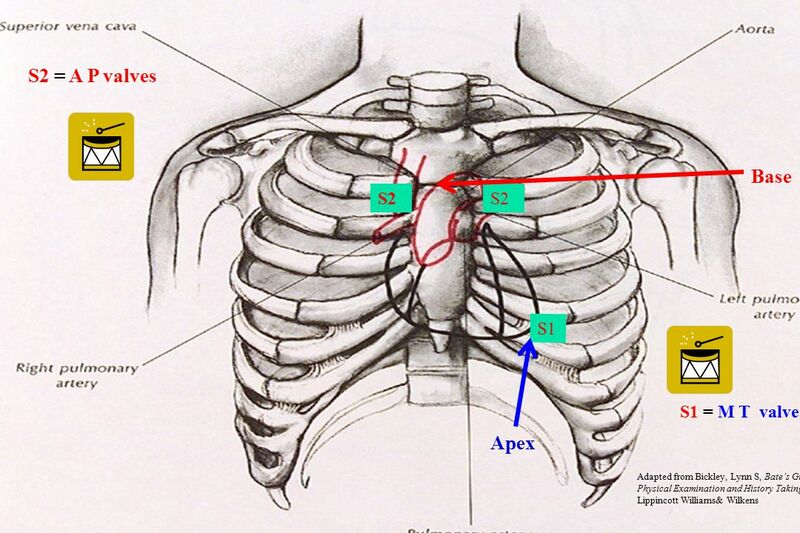 The Left Bundle Branch has septal, anterior and posterior fascicles. 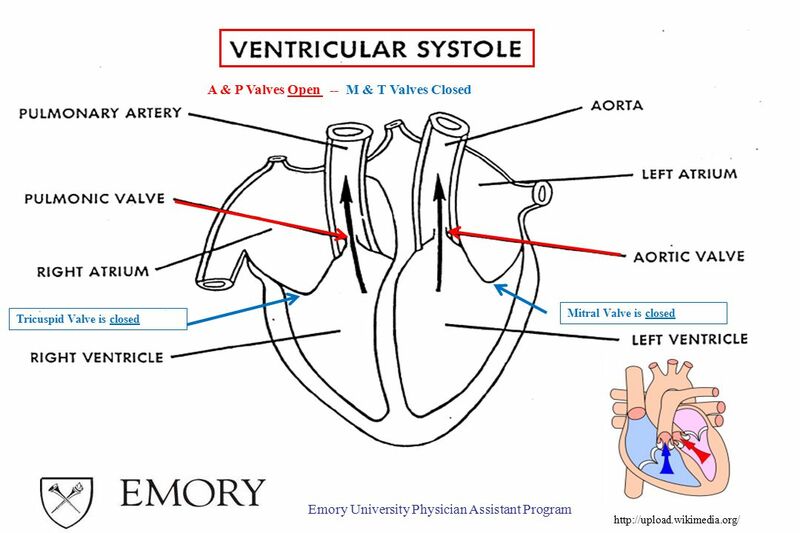 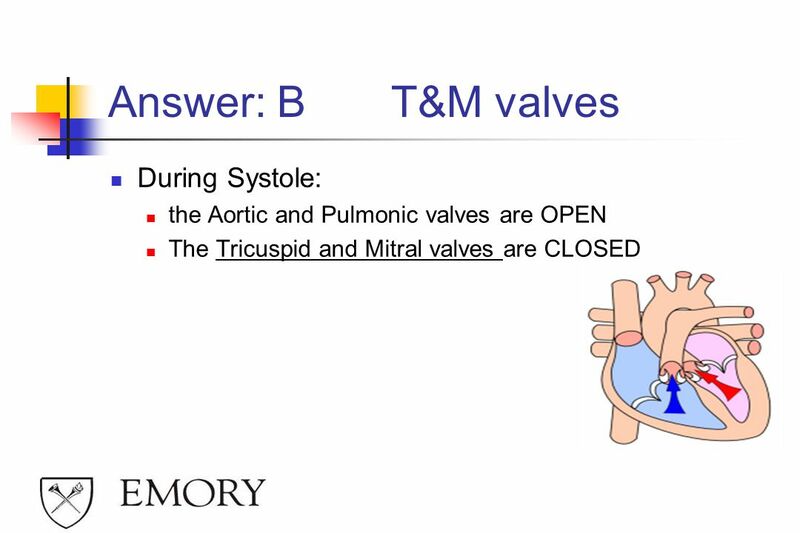 13 Quiz Which valves are normally closed during systole? 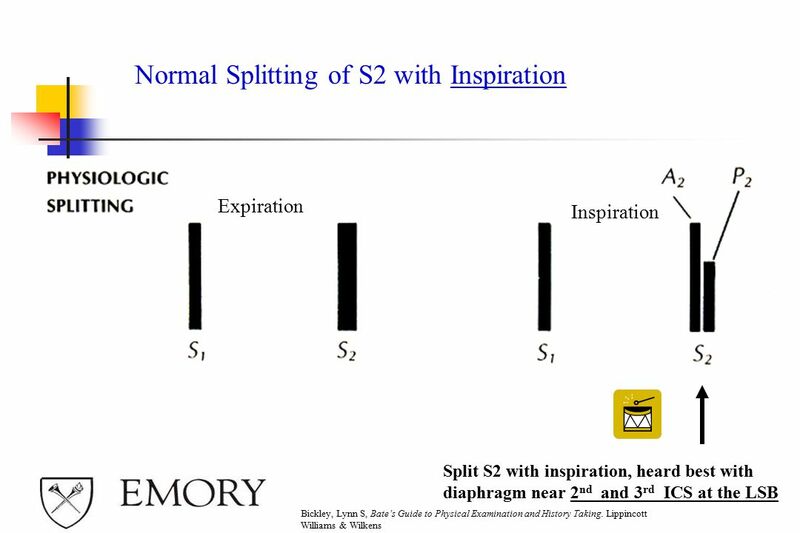 21 Which of the following best describes the normal splitting of S2? 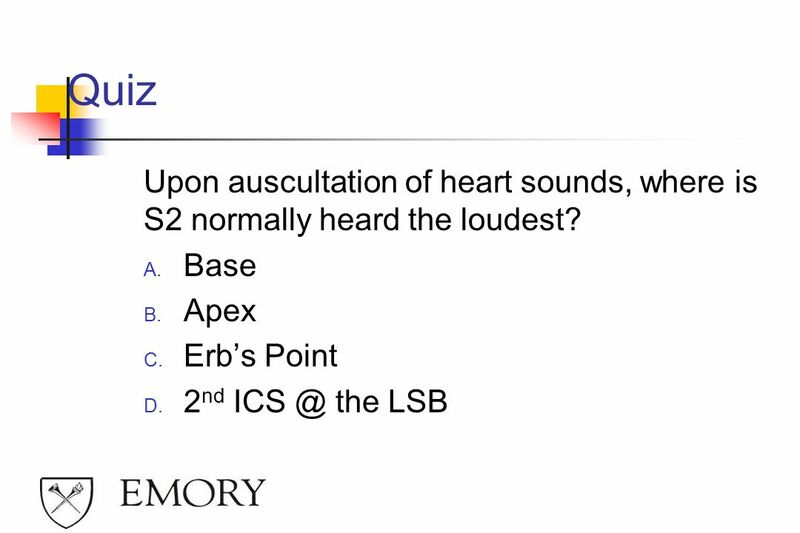 22 Answer: B If present, a split S2 is best heard near Erb’s Point (3rd LSB or over the Pulmonic valve area (2nd and During Inspiration, venous return of blood to the right side of the heart, slows the right-sided physiologic events, causing a delay in the closure of the pulmonic valve. 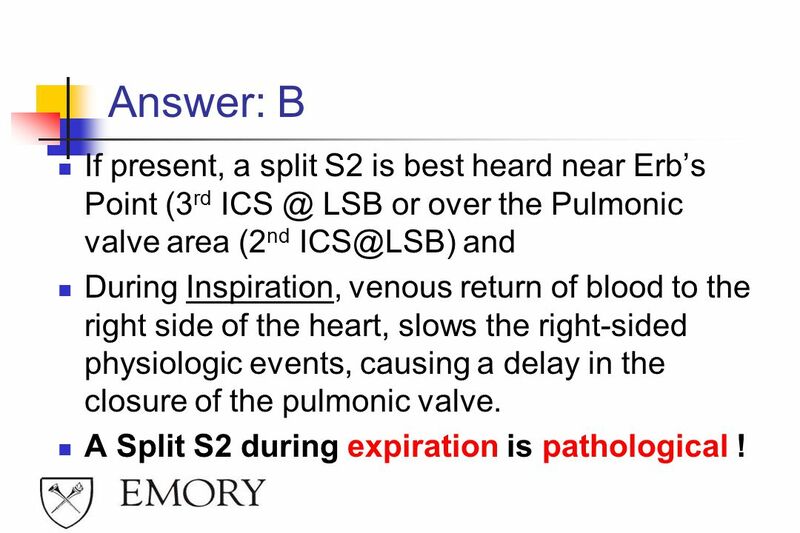 A Split S2 during expiration is pathological ! 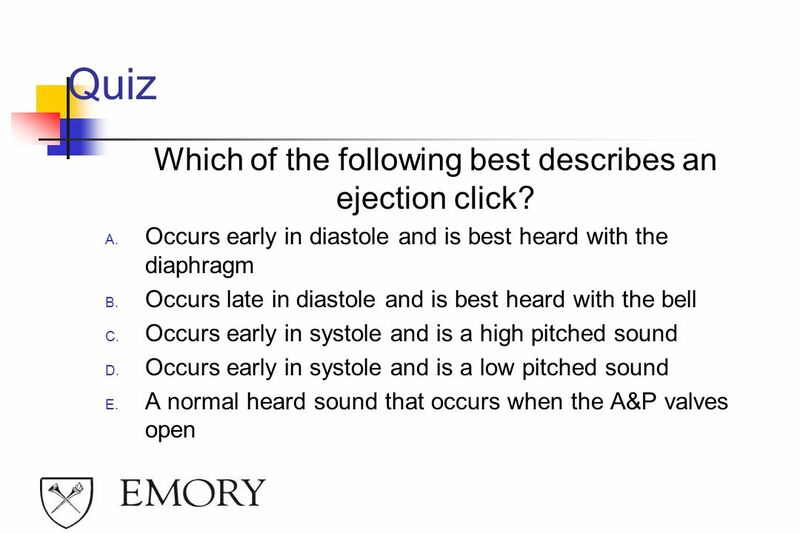 29 Which of the following best describes an ejection click? 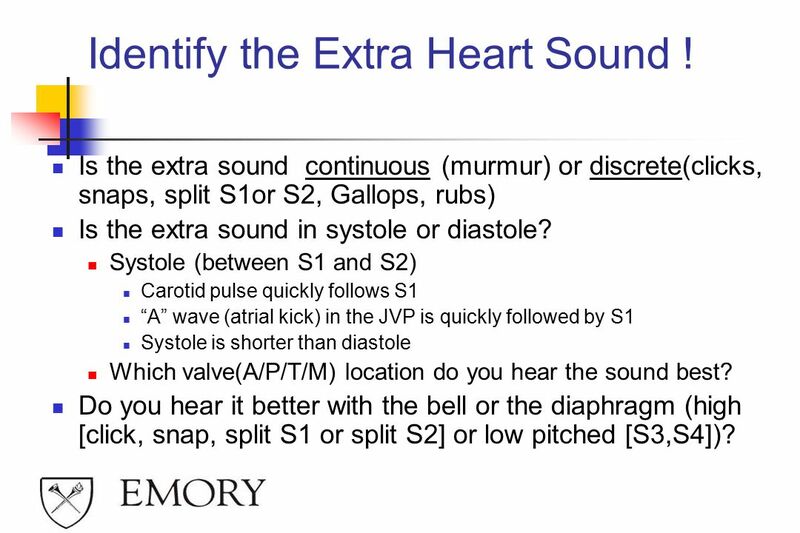 31 Identify the Extra Heart Sound ! 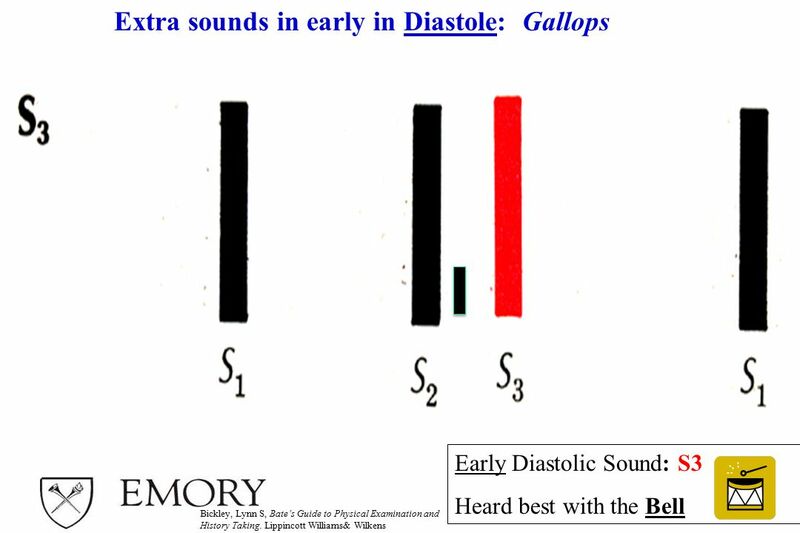 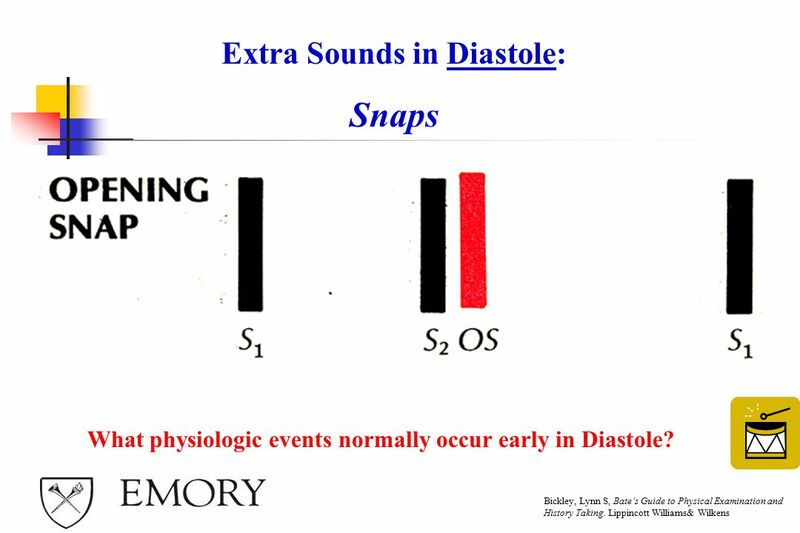 Is the extra sound continuous (murmur) or discrete(clicks, snaps, split S1or S2, Gallops, rubs) Is the extra sound in systole or diastole? 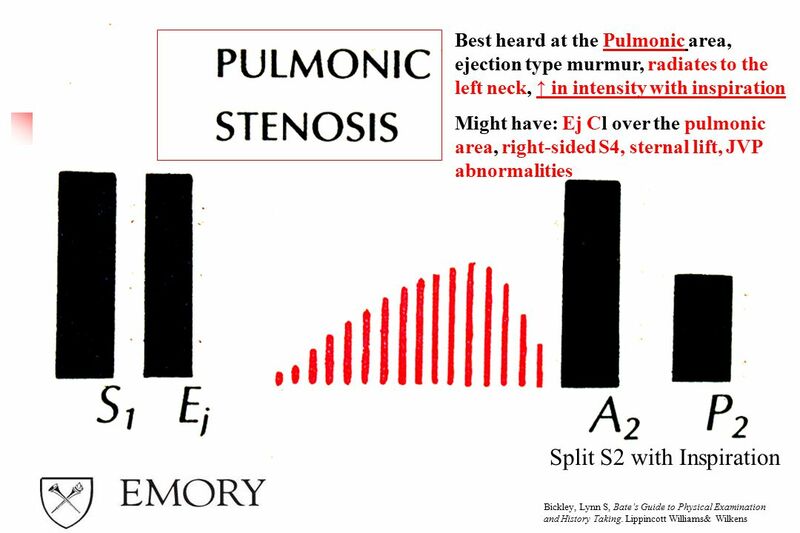 Systole (between S1 and S2) Carotid pulse quickly follows S1 “A” wave (atrial kick) in the JVP is quickly followed by S1 Systole is shorter than diastole Which valve(A/P/T/M) location do you hear the sound best? 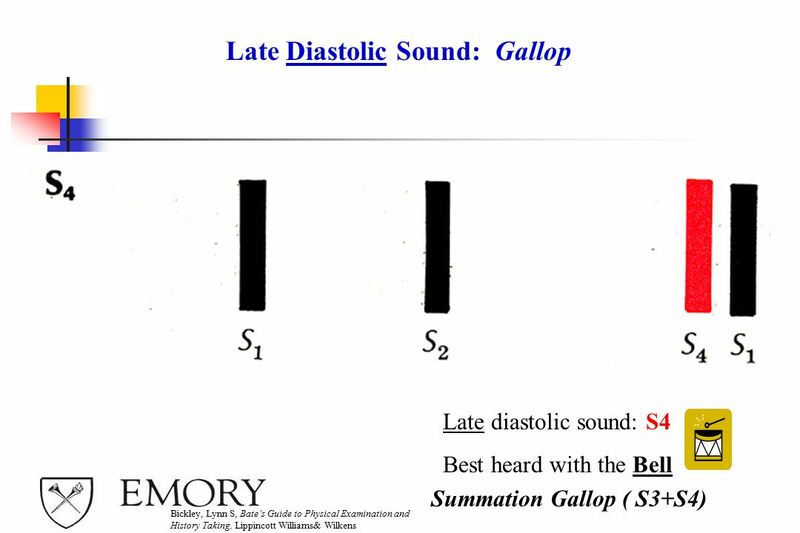 Do you hear it better with the bell or the diaphragm (high [click, snap, split S1 or split S2] or low pitched [S3,S4])? 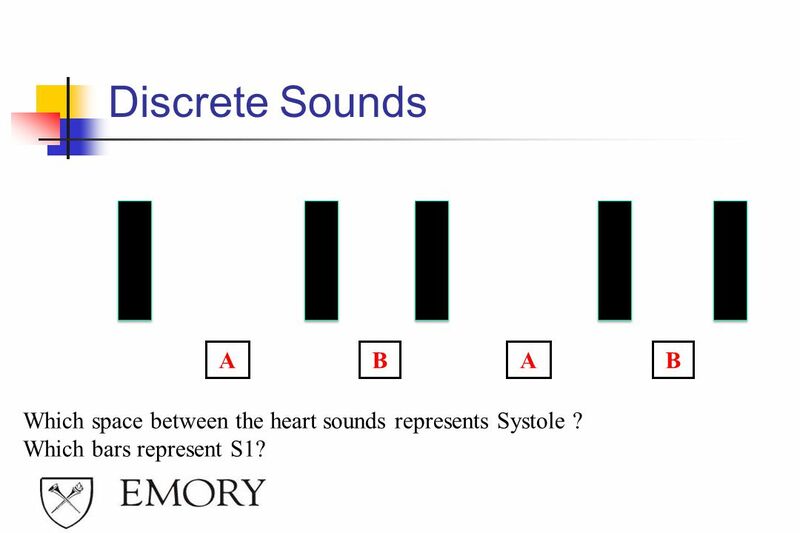 32 Discrete Sounds A B A B Which space between the heart sounds represents Systole ? 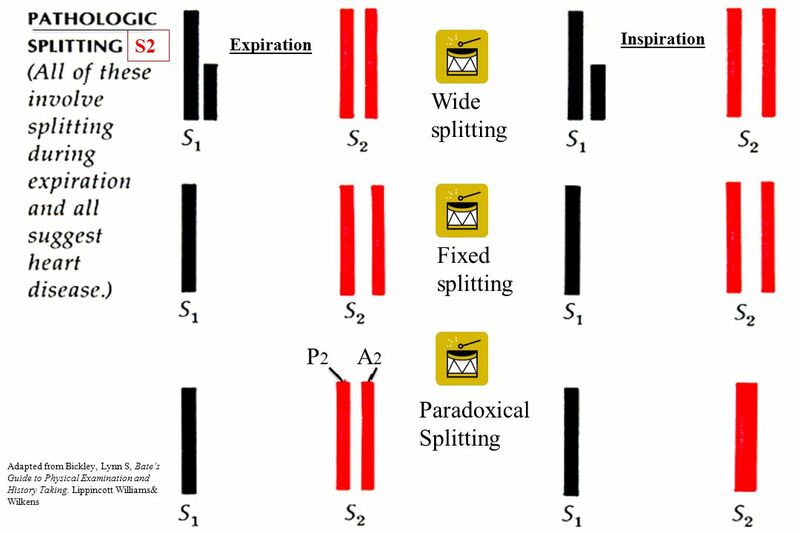 Which bars represent S1? 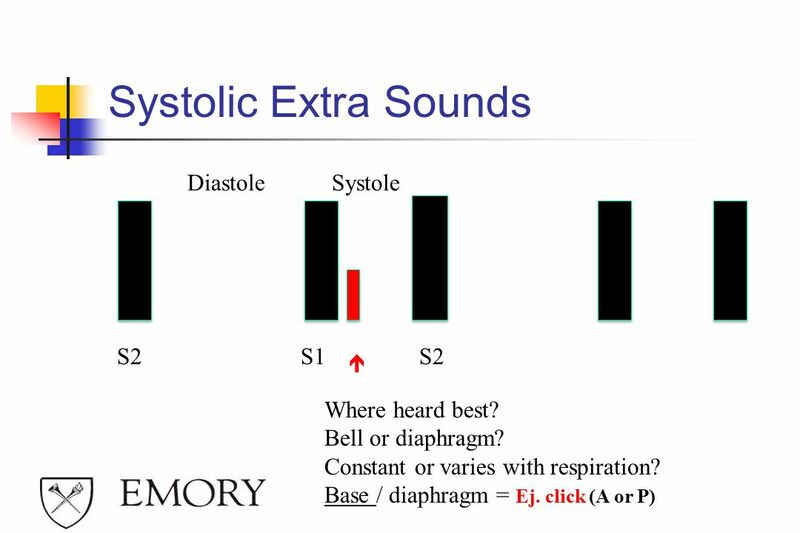 35 Systolic Extra Sounds Diastole Systole S2 S1 S2 Where heard best? 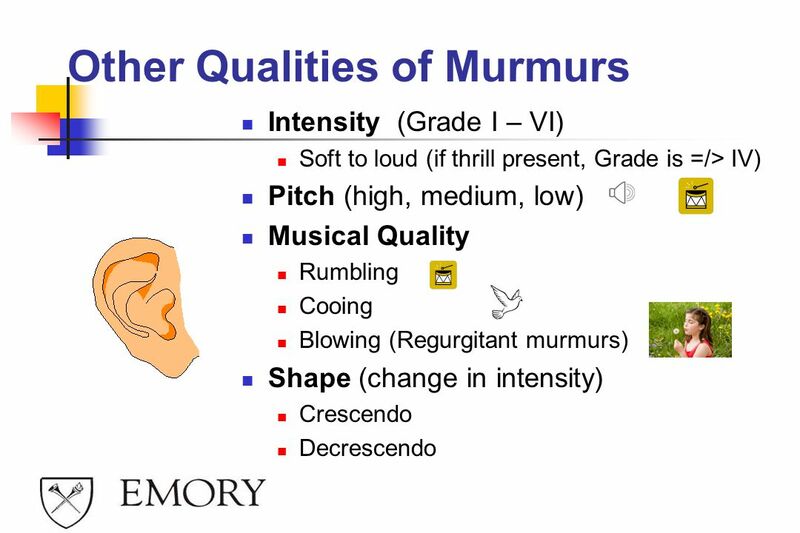 Intensity (Grade I – VI) Soft to loud (if thrill present, Grade is =/> IV) Pitch (high, medium, low) Musical Quality Rumbling Cooing Blowing (Regurgitant murmurs) Shape (change in intensity) Crescendo Decrescendo Intensity: Graded on a scale of I - VI Grade I - barely audible; examiner must concentrate to hear this Grade II - soft, but audible Grade III - loud Grade IV - louder and associated with a thrill Grade V - very loud, it can be heard with the stethoscope head 1/2 off the chest, and is associated with a thrill Grade VI - so loud it can be heard without a stethoscope Pitch: High, medium, low determined by which head of the stethoscope hears the murmur best ( low-pitched murmurs heard best with the bell). 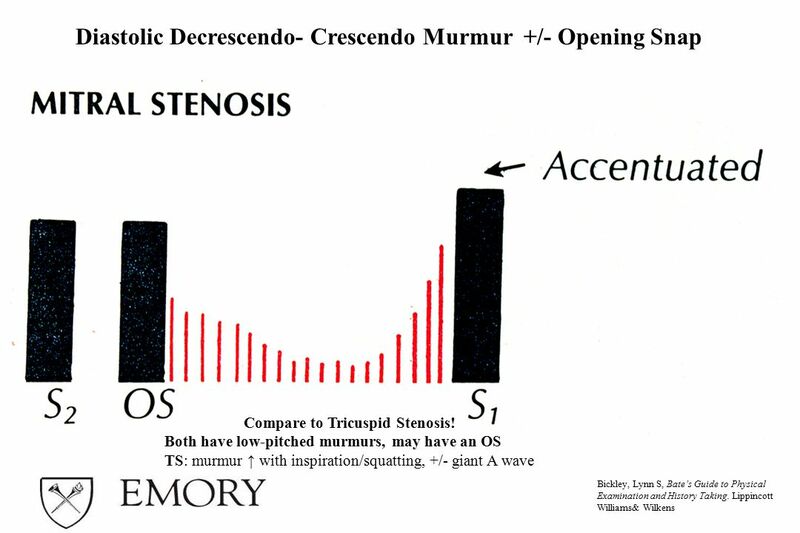 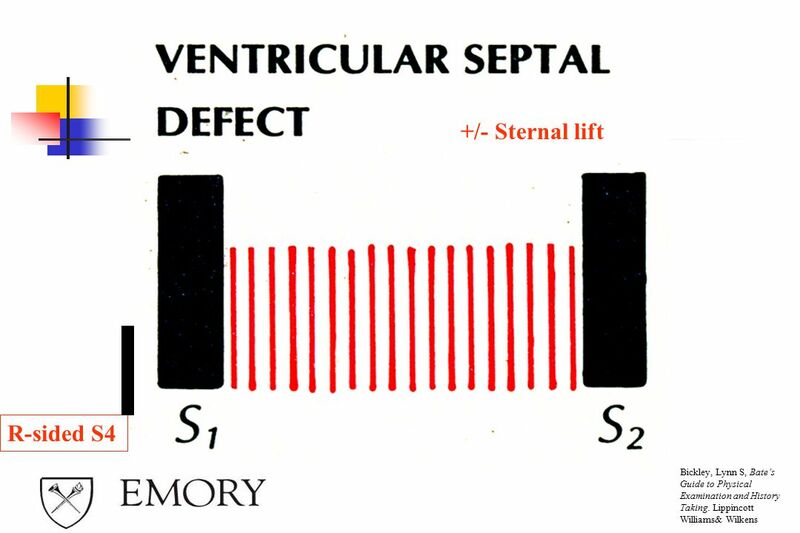 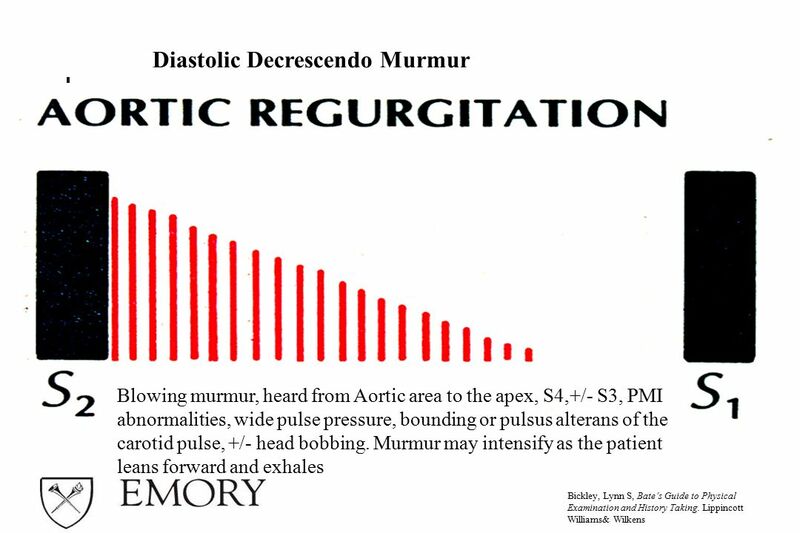 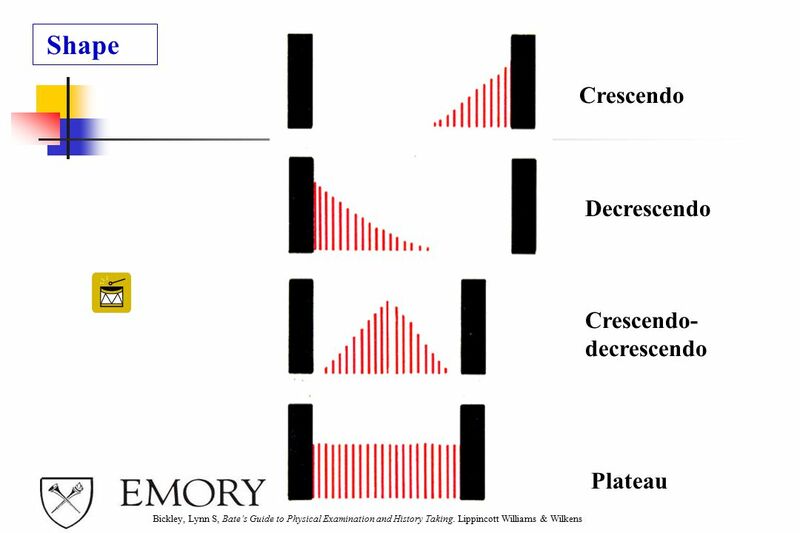 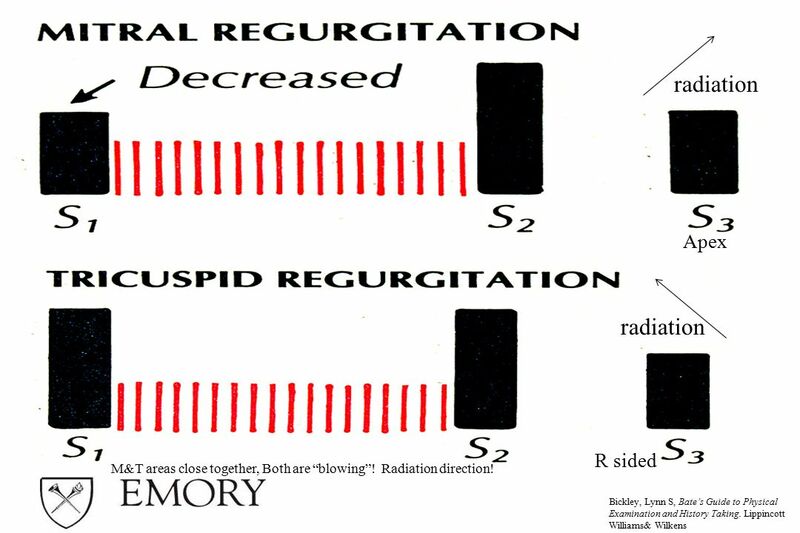 In general, flow murmurs are low to medium pitched, regurgitant murmurs are high-pitched Musical Quality: Regurgitant murmurs usually described as “ blowing” Mitral Stenosis- rumbling MVP- cooing PDA- machinery-like Shape : Crescendo- increasing in intensity Decrescendo - decreasing in intensity Crescendo- Decrescendo - increasing then decreasing. 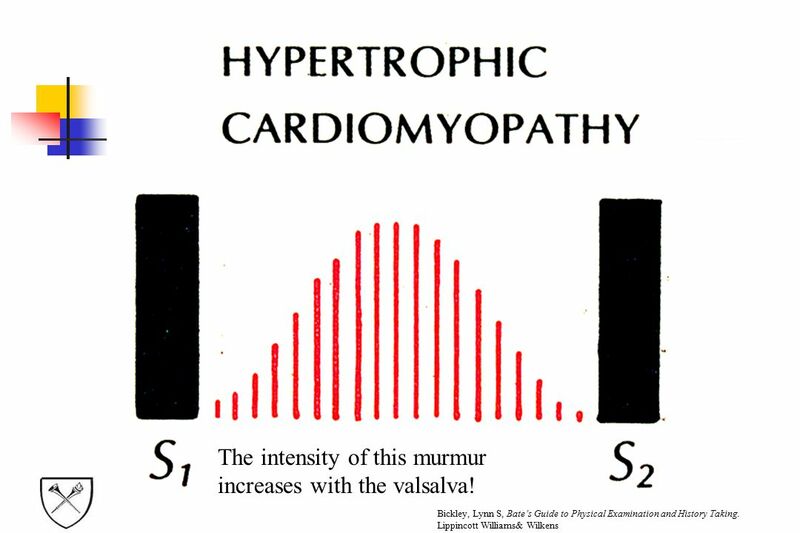 58 The intensity of this murmur increases with the valsalva! 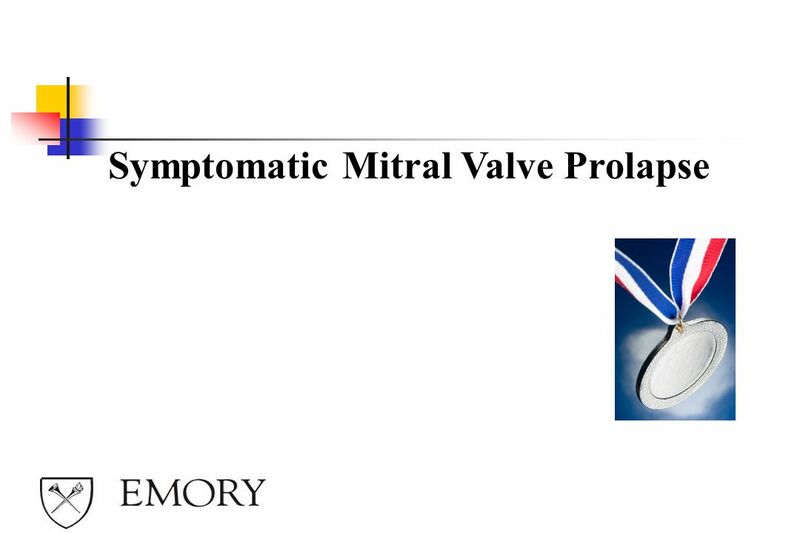 mitral valve leaflets Backward direction of flow at a competent mitral valve, but the mitral leaflets billow Mitral valve prolapse Click-murmur or Click alone or Murmur alone Confirm by auscultating over the Mitral region while standing and squatting, or change with the valsalva maneuver Valsalva/Standing lengthens the murmur; Squatting shortens it chordae tendinae MVP classically: is associated with a high pitched click, followed by a systolic, crescendo murmur, heard best in the mitral region. 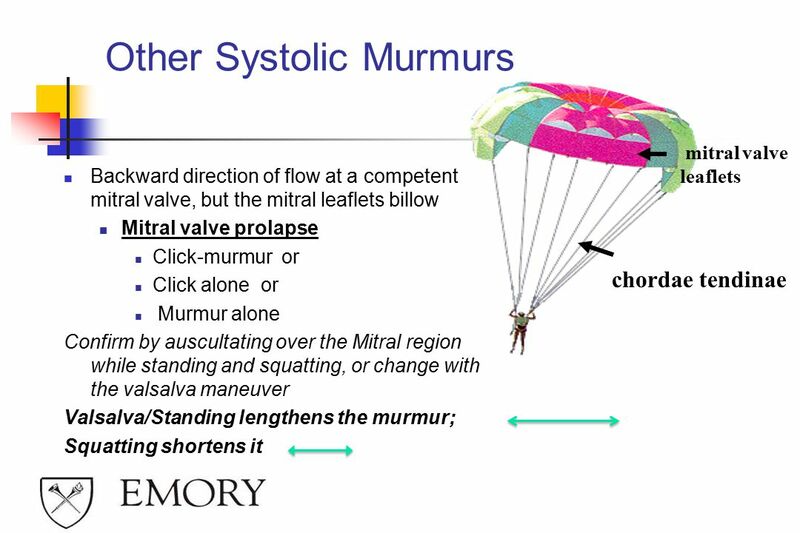 Valsalva and standing moves the click or click/murmur earlier in systole, lengthening the murmur; squatting delays the click/murmur. 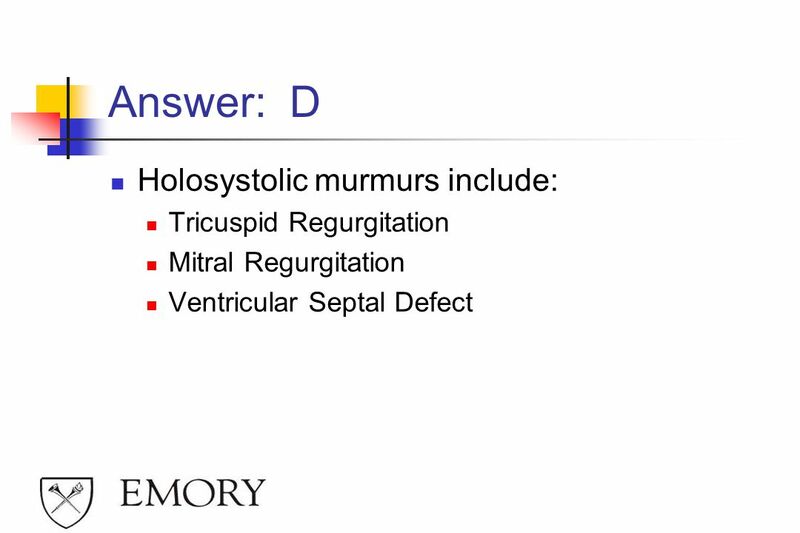 63 Which of the following conditions would cause a holosystolic murmur? 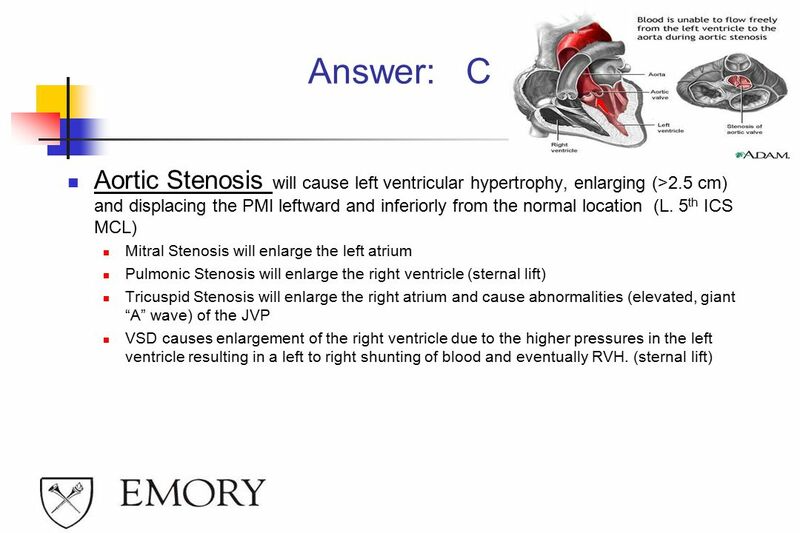 66 Compare to Tricuspid Stenosis! 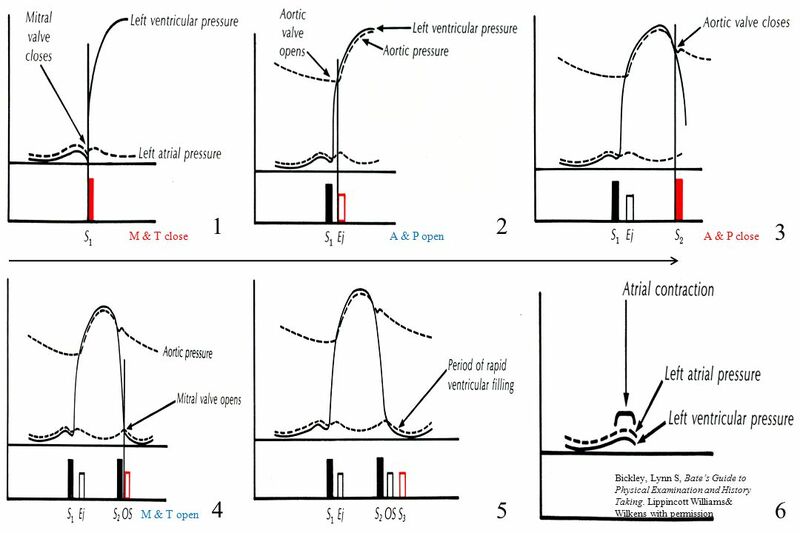 78 18 y.o. 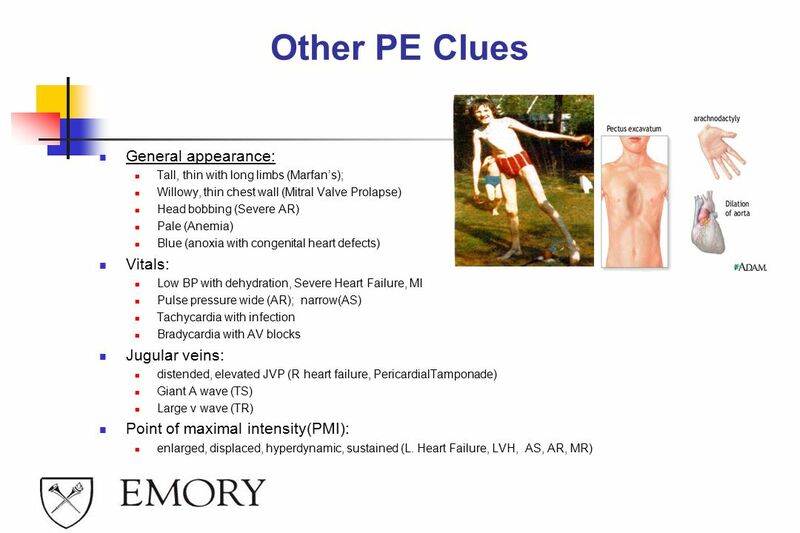 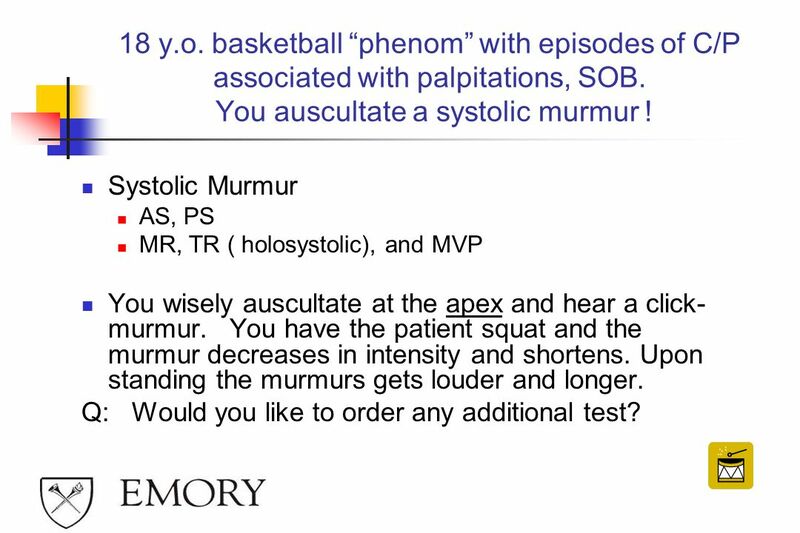 basketball “phenom” with episodes of C/P associated with palpitations, SOB. 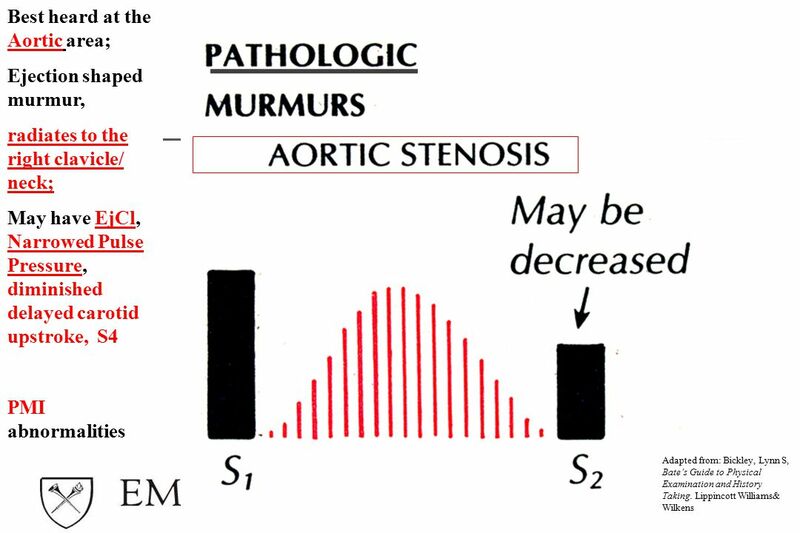 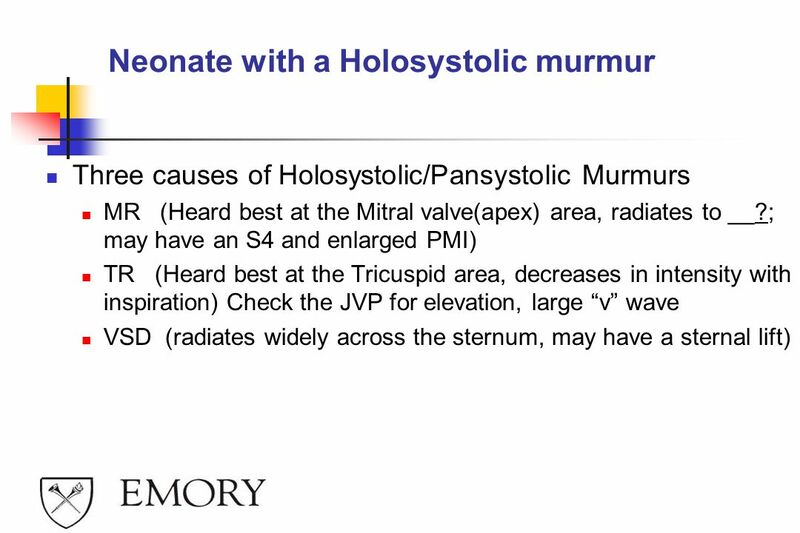 You auscultate a systolic murmur ! 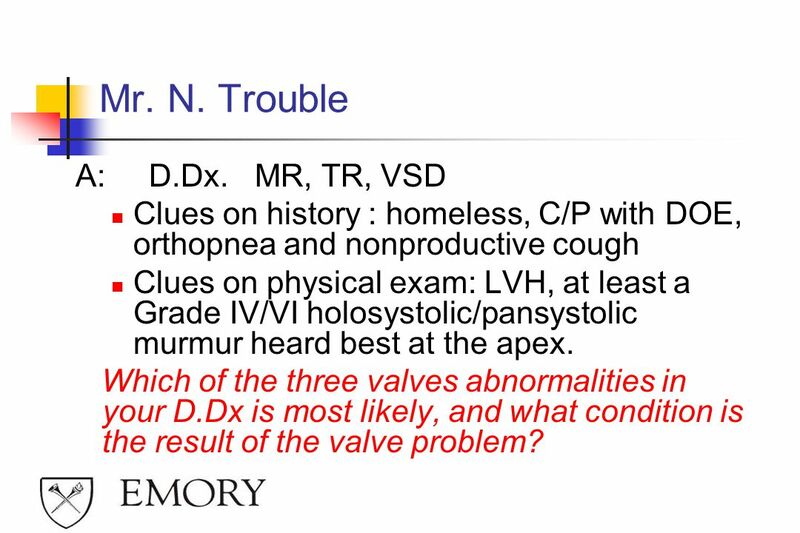 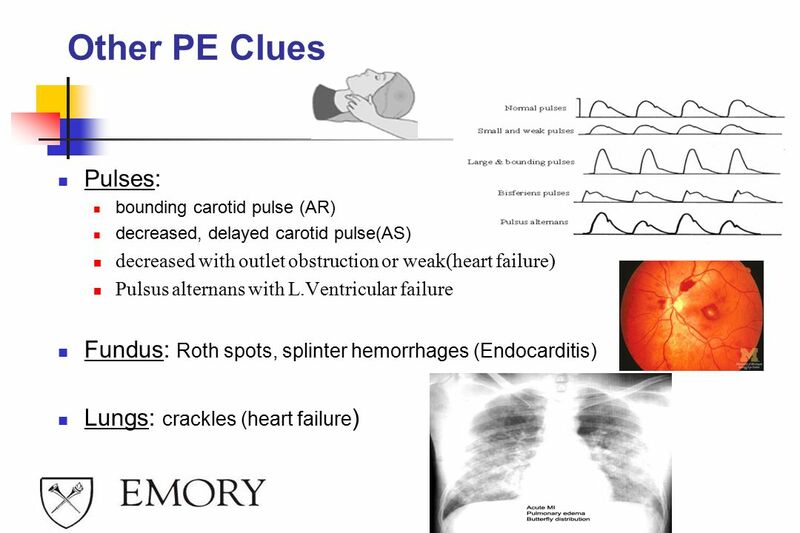 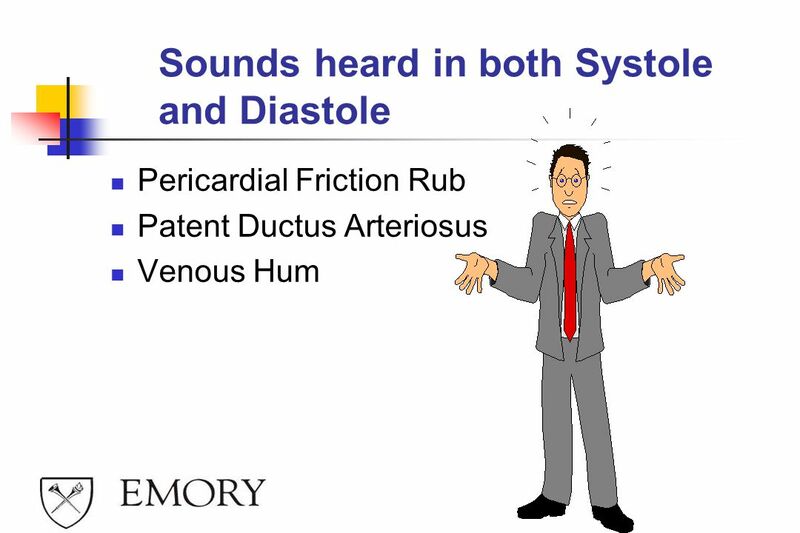 Systolic Murmur AS, PS MR, TR ( holosystolic), and MVP You wisely auscultate at the apex and hear a click-murmur. 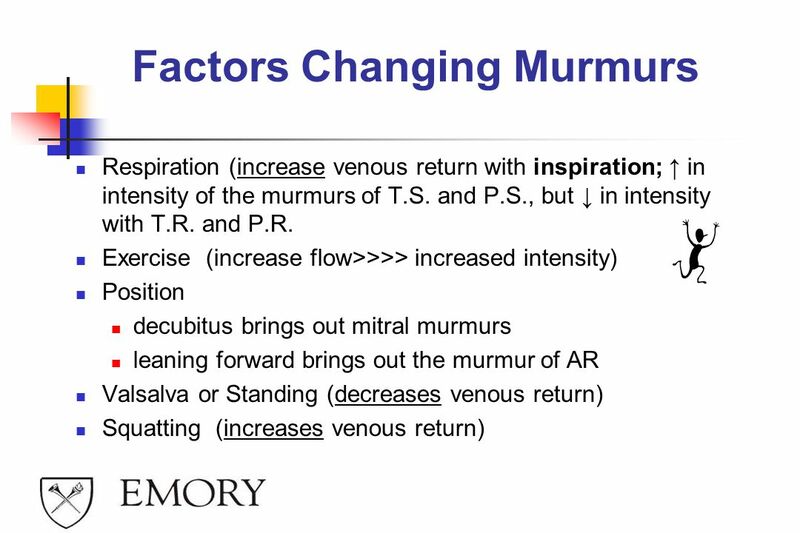 You have the patient squat and the murmur decreases in intensity and shortens. 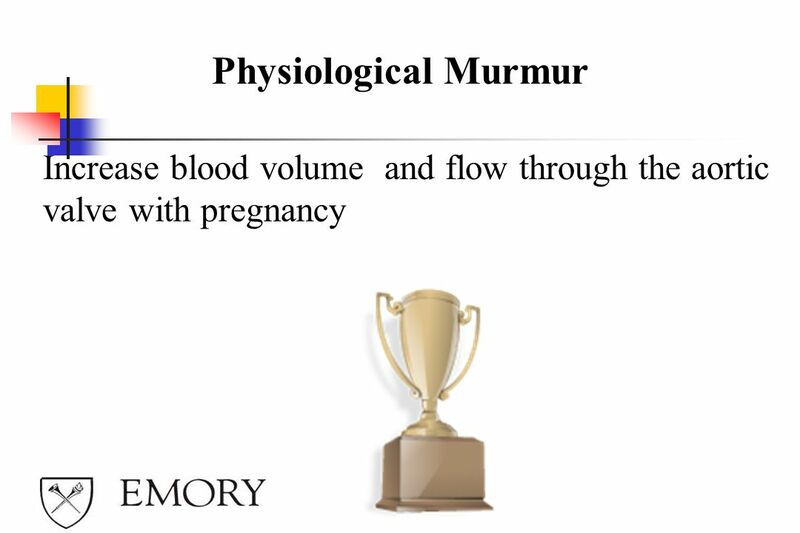 Upon standing the murmurs gets louder and longer. 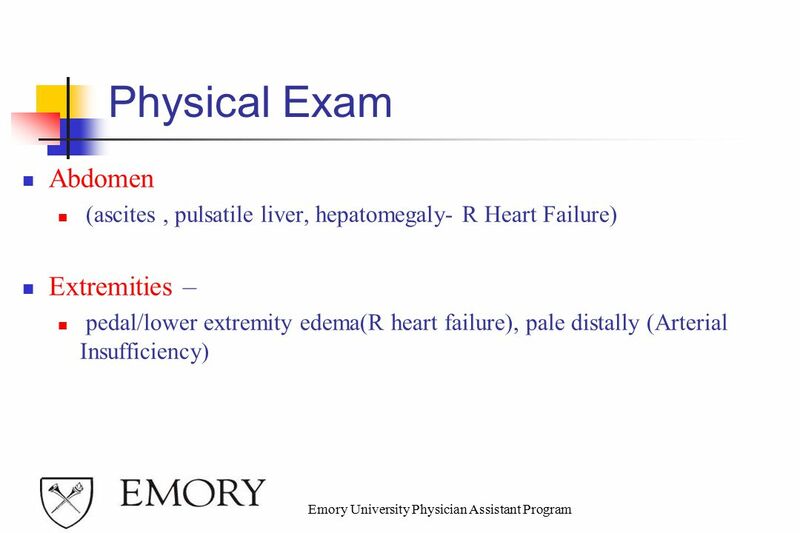 Q: Would you like to order any additional test? 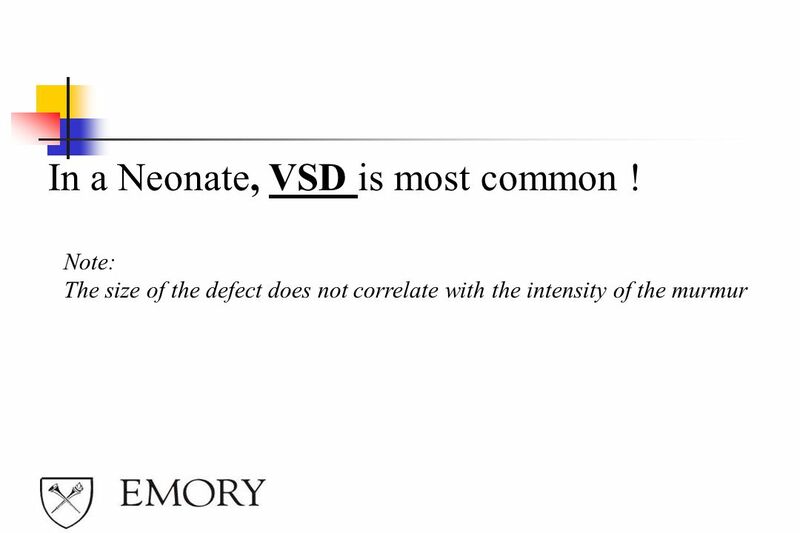 81 In a Neonate, VSD is most common ! 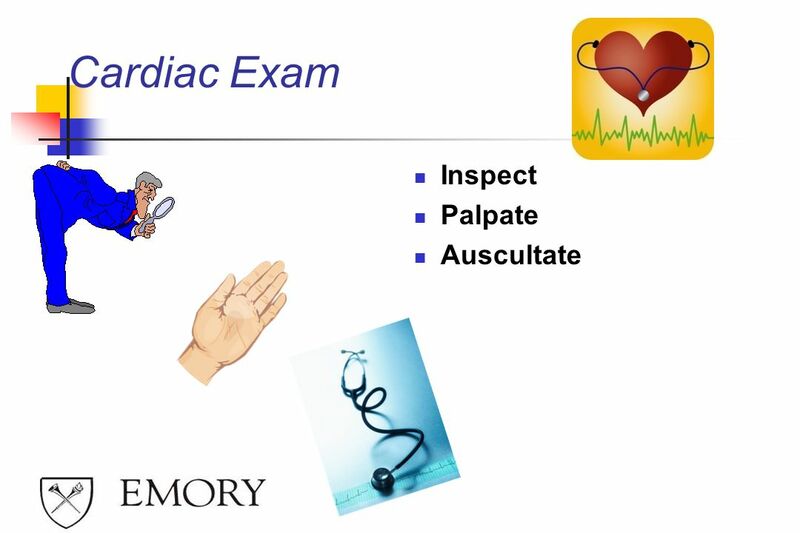 84 Auscultate at the axilla to confirm! 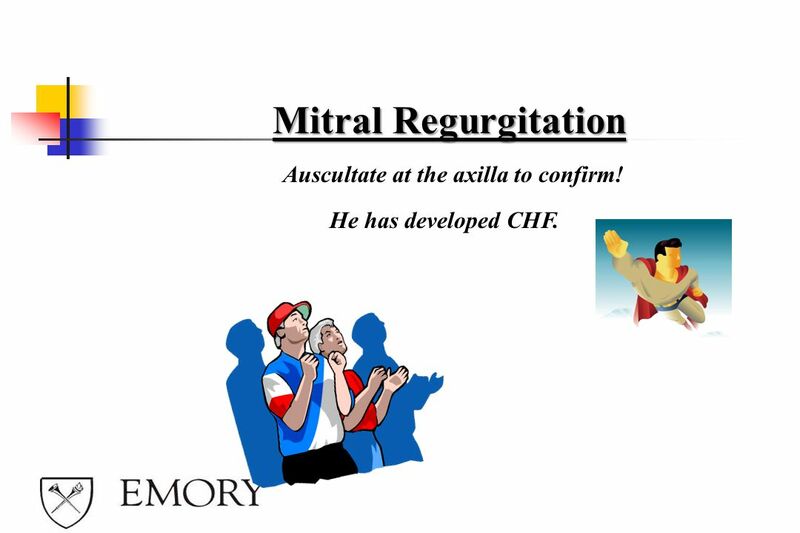 Mitral Regurgitation Auscultate at the axilla to confirm! 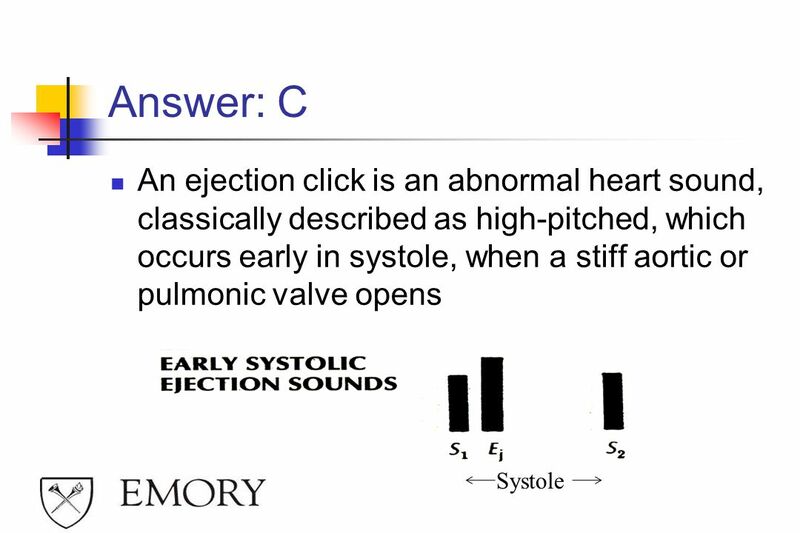 He has developed CHF. 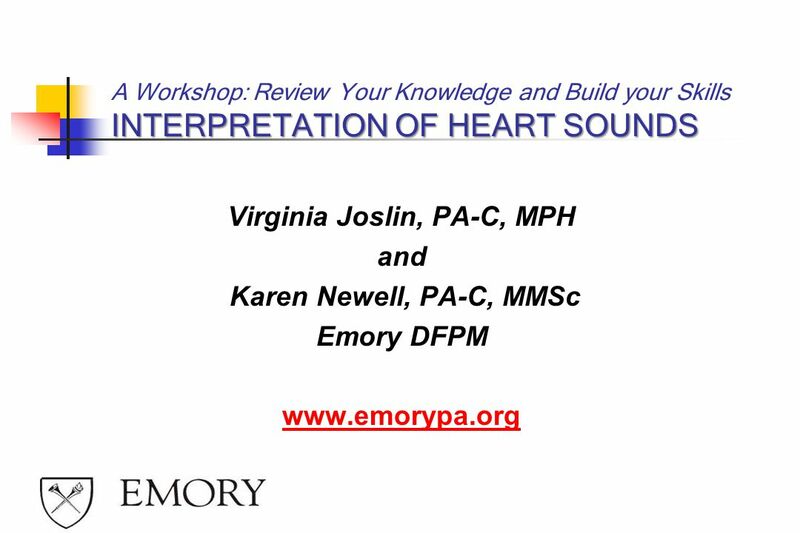 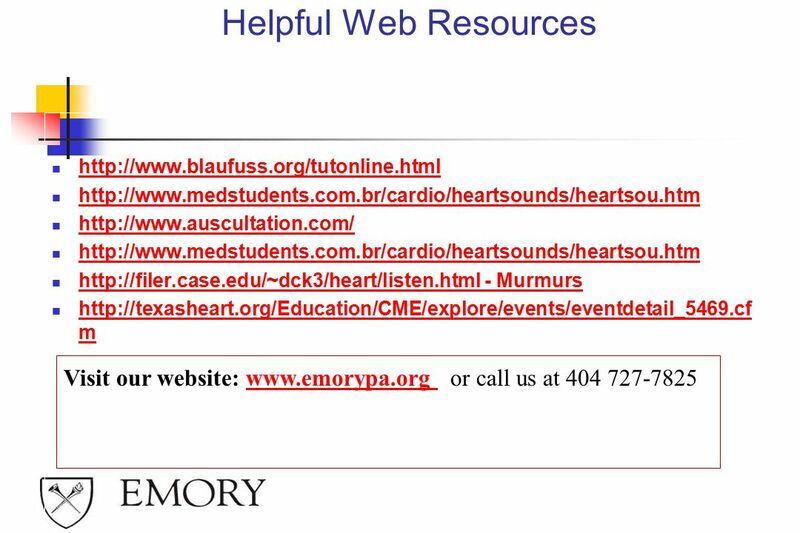 Download ppt "Virginia Joslin, PA-C, MPH"
CARDIOVASCULAR Valvular Disease. 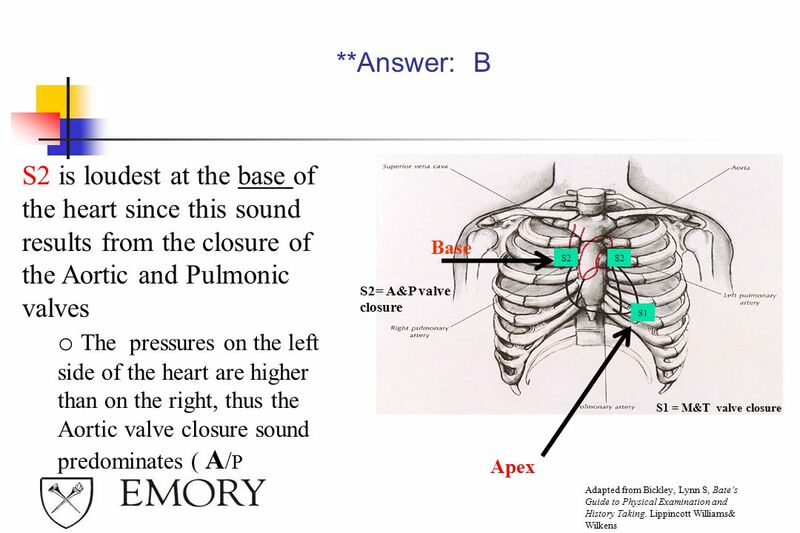 What are we going to do? 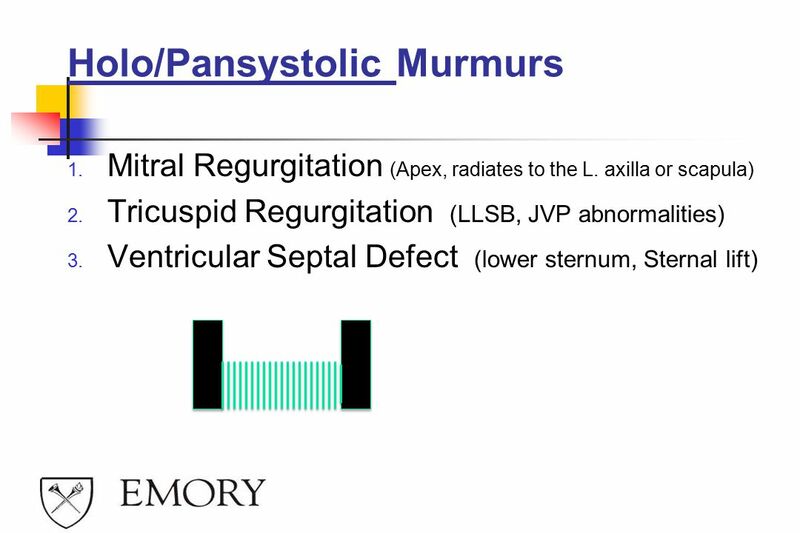 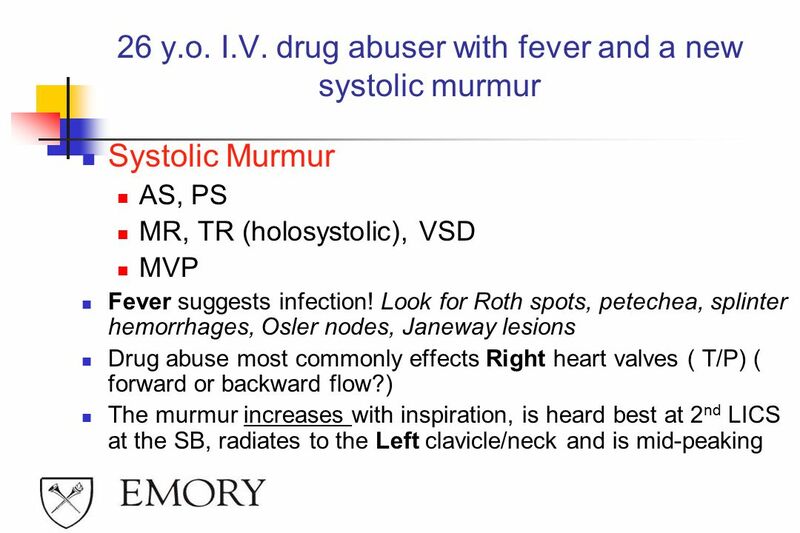 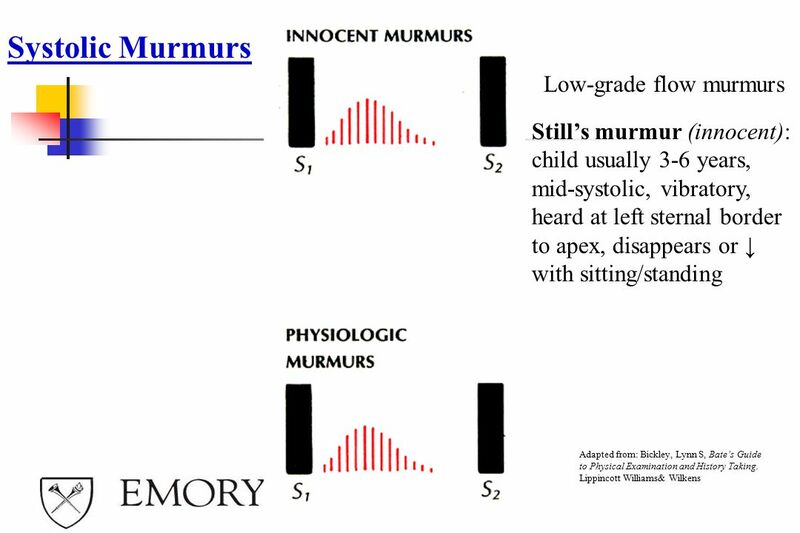  How do murmurs present? 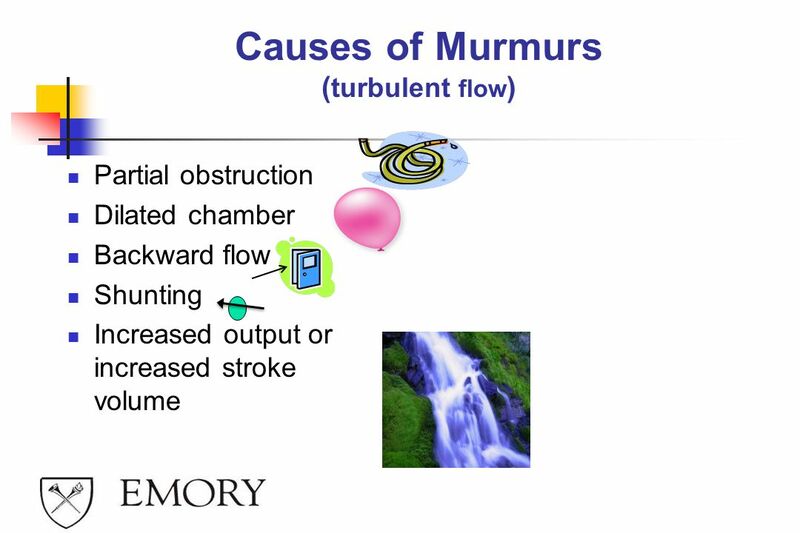  What causes murmurs? 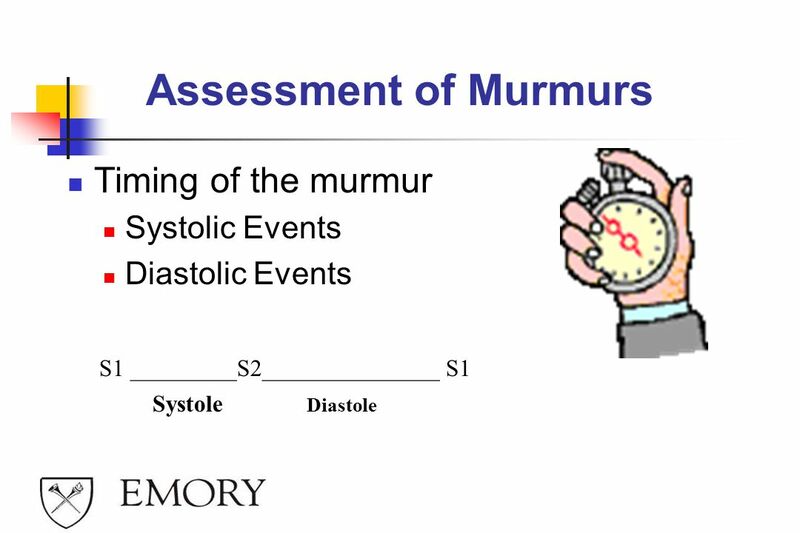  What the **** is this murmur? 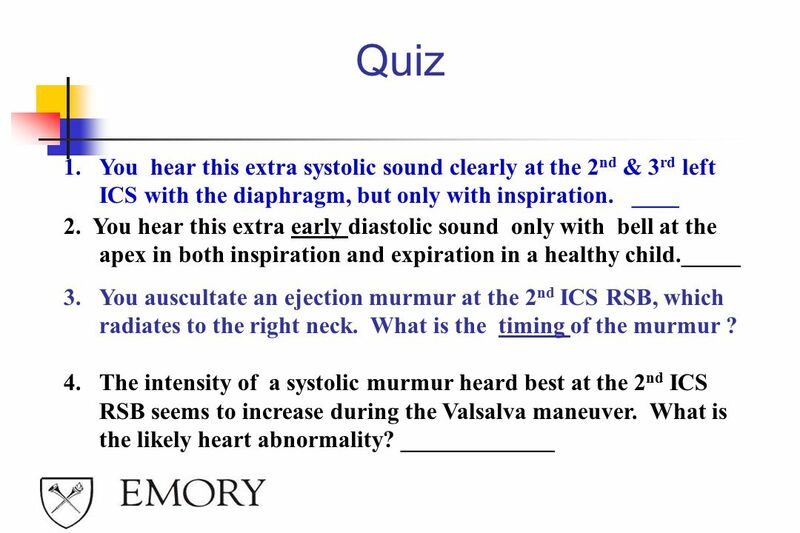  QUIZ! 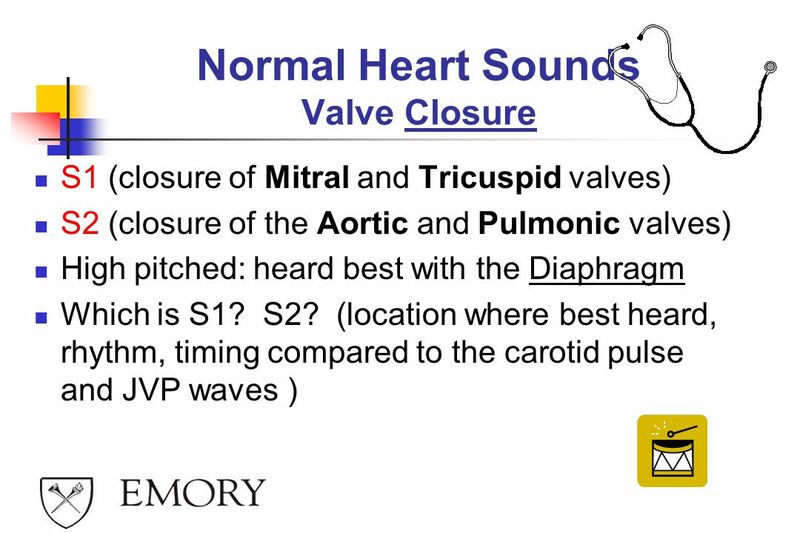 The Second Heart Sound (S 2 ) Chapter 8 Are G. Talking, MD, FACC Instructor Patricia L. Thomas, MBA, RCIS. 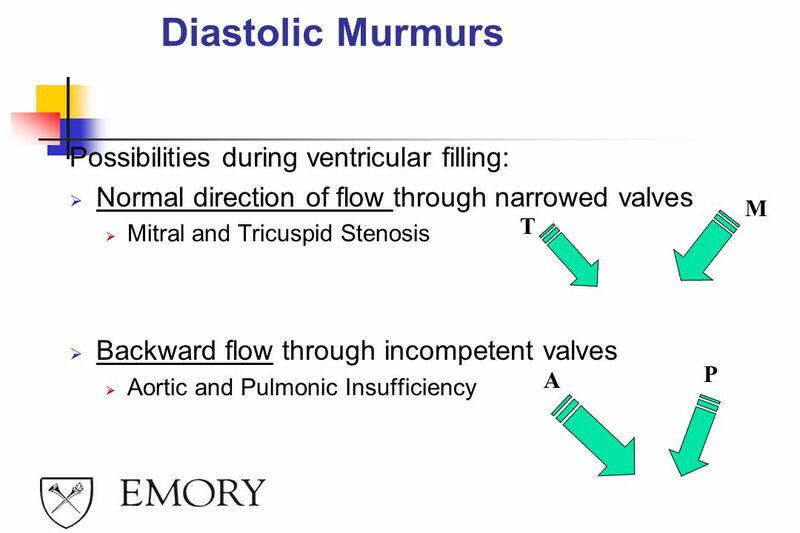 Dr Will Ricketts Clinical Teaching Fellow, Bart’s Health Honorary Lecturer, QMUL. 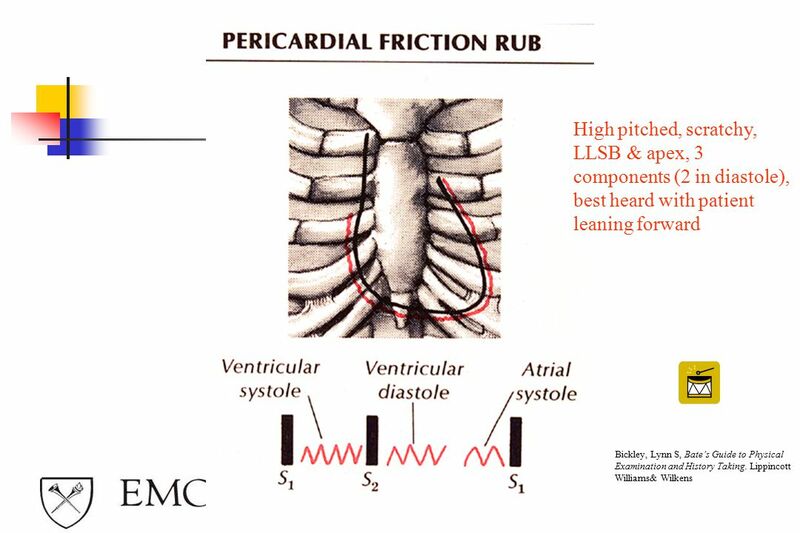 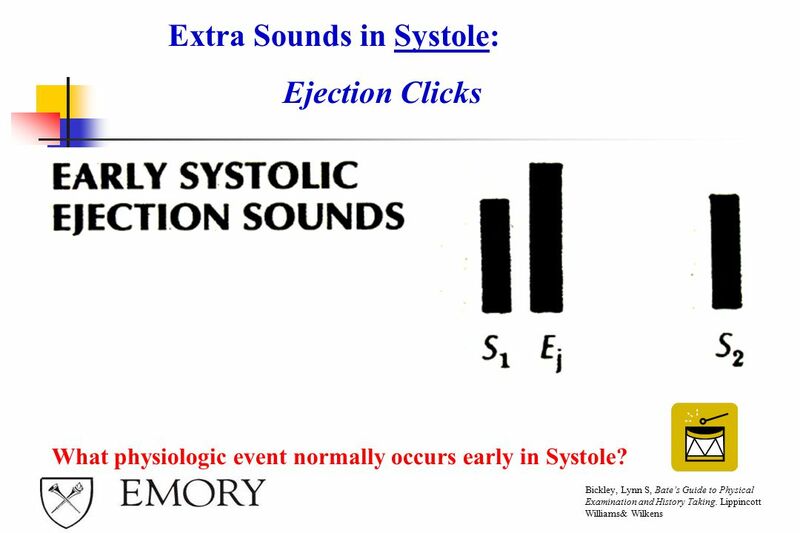 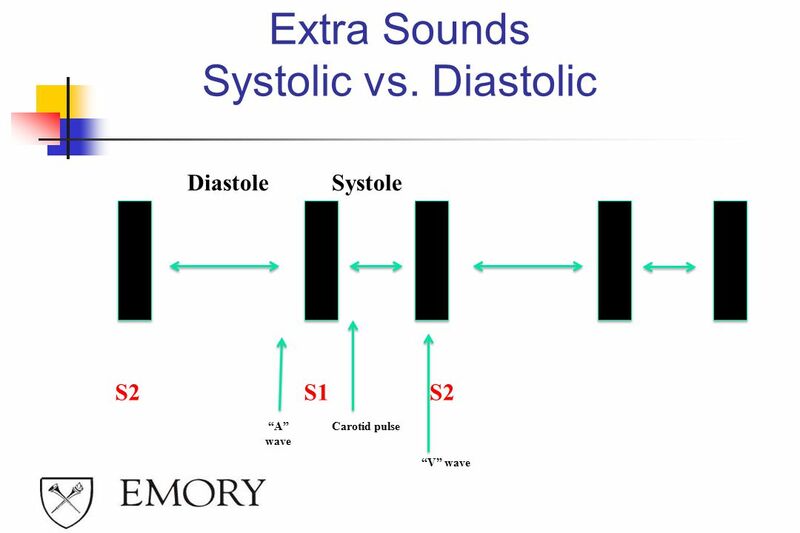 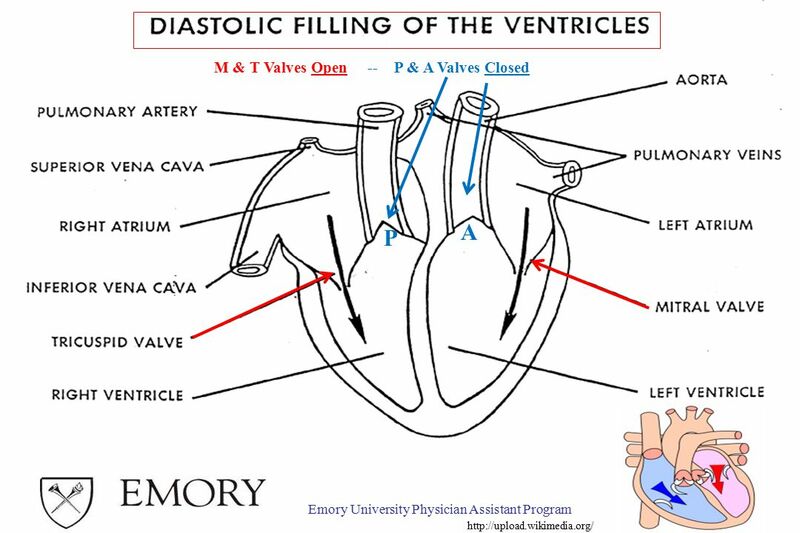 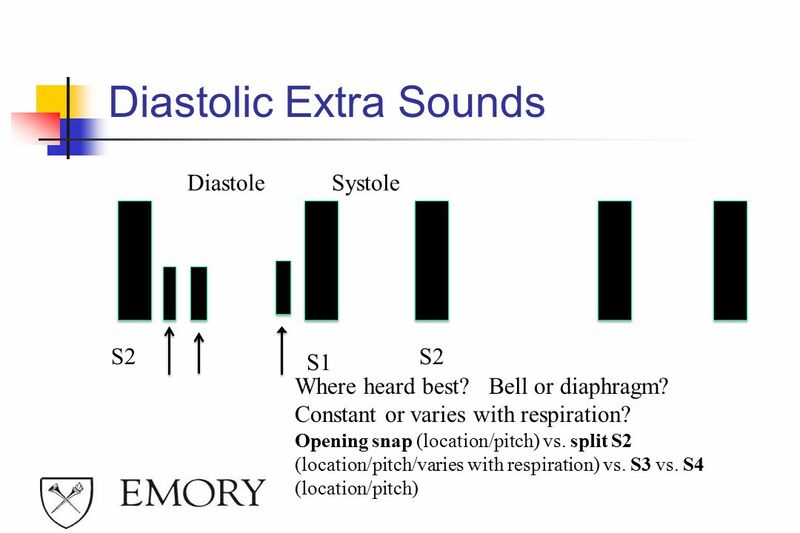 Ejection Sounds & Systolic Clicks Chapter 11 Are G. Talking, MD, FACC Instructor Patricia L. Thomas, MBA, RCIS. 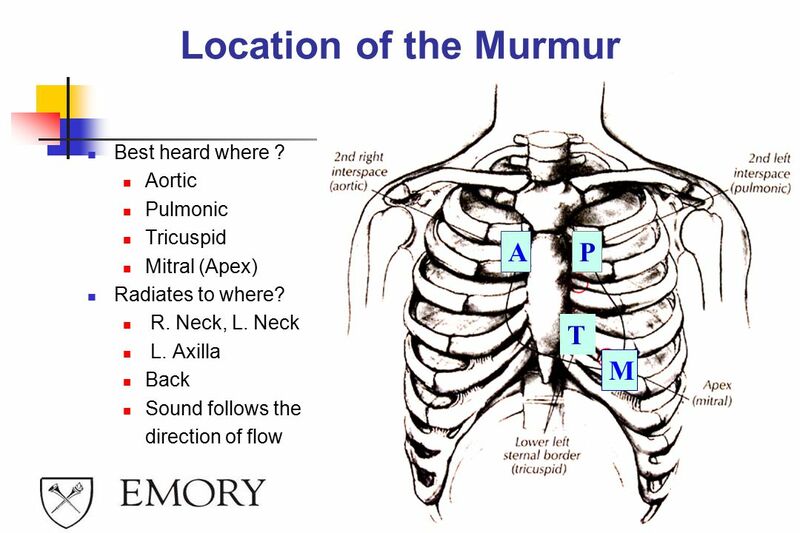 Cardiac Auscultation Jay L. Rubenstone, D.O., F.A.C.C. 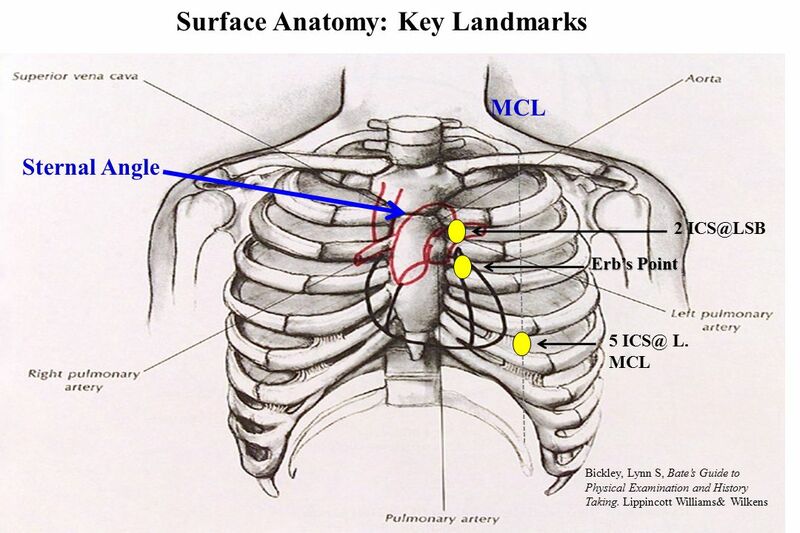 September 2007.